Can you believe how fast 2018 went? Yikes. They say every year older you get, the faster time goes… not cool with that. ESPECIALLY because I turn 30 this year. But anyways, we ended 2018 and started 2019 on such a fun and relaxing note— CRUISIN’ TO CUBA! 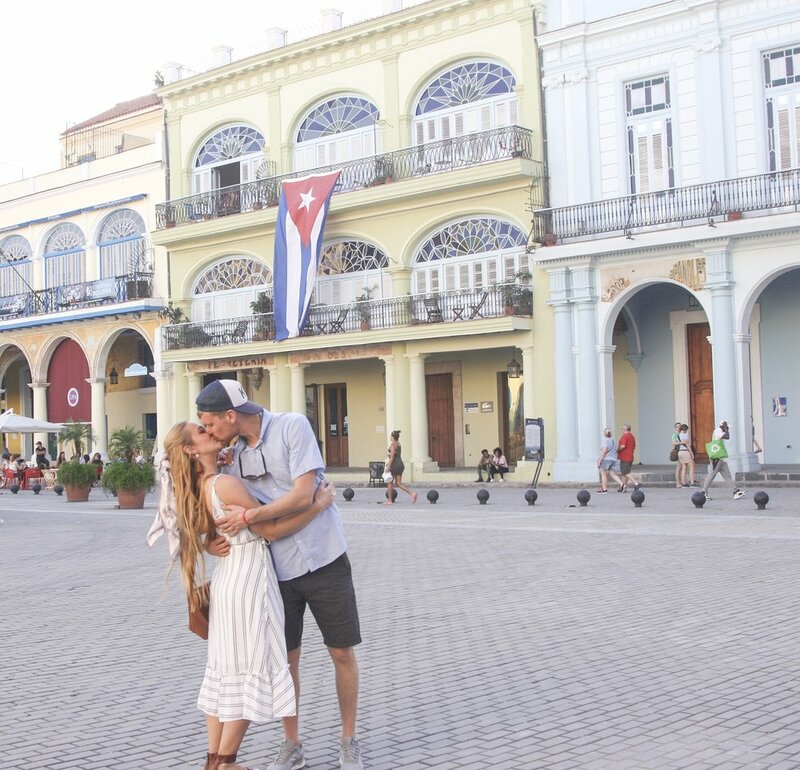 John and I have always wanted to go to Cuba… well, at least since it’s been opened back up— so we were determined to get there some how and soon, before it all started to change! It got a little harder to get there this year, but we found a way! John’s parents also wanted to go, so they came with us! 2. Exhausted from all of the fun (but exhausting) Christmas festivities. We left from Miami, Florida and sailed overnight to Cuba. We actually spent New Years Eve and New Years Day in Cuba which was really interesting because they don’t really celebrate it like we do! Everything was pretty quiet and a lot of places were closed, but we still had the best time. It was actually kind of nice and perfect for photo ops! Before leaving, I had not planned much of anything… (what else is new? )… but I HAD looked up a convertible tour company and found one that looked good— and was open… a lot of them were closed for the holiday. A quick email later and our booking was confirmed! Upon arrival, Michel, was waiting for us with a sign and my name on it. He was so warm and friendly, and immediately started telling us about his amazing country. He walked us to his bright red convertible and introduced us to Maykel, our driver. We loved that Michel had a driver, because he was able to really focus on telling us all about Cuba. They drove us around the city and I couldn’t help but admire all of the 1950’s cars, including the one we were in! It seriously felt like we had stepped back in time. They were everywhere and so beautiful. Even the taxis were old colorful cars… wish they still made them like that! When the world cut off trade with Cuba, the Cuban mechanics had to make things work without extra parts… they say the mechanics here are magic. I believe it! Our first stop was the huge Jesus statue overlooking Havana. We walked and talked, and learned some awesome facts and history about the city and country. It was so interesting hearing Michel’s view on the history and turmoil between the states and Cuba. My favorite thing he said was the famous quote “there’s your side, my side, and the truth.”… so true! He even showed us one of the missiles that had been pointed at the U.S. during the Cuban Missile Crisis. CRAZY! He told us that this is the “party Jesus” because he is holding a cuban cigar and a mojito! Haha! Really does look it! 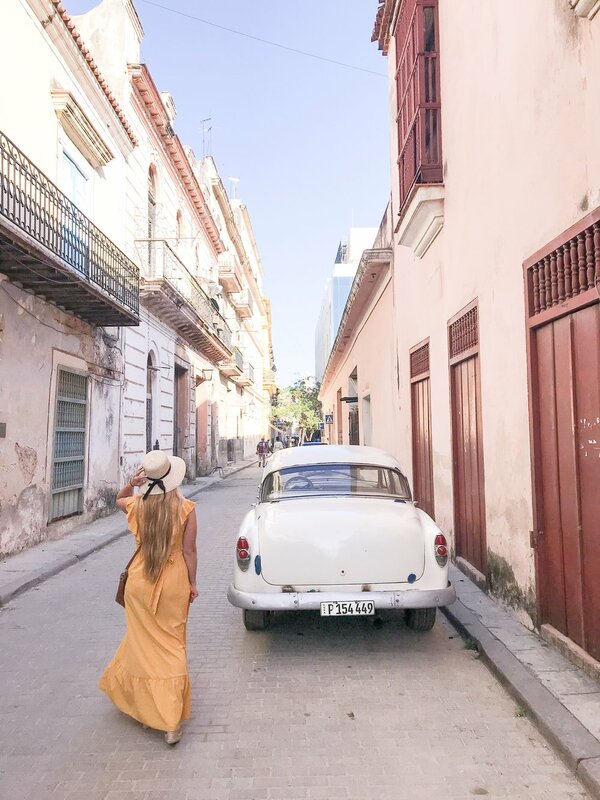 Our tour continued through the colorful streets of Havana, driving around with the wind blowing in our hair…. “(and in my mind I was singing “Havana oh na na” the whole time haha!!!). We stopped at the Capital, because— duh, it was picture time! Michel was snapping pics the whole time too, and sent them to me a week later. They were so good and I loved the candid nature of them all! He told us that The Capital building looks just like one in the states, but is actually 4 inches taller than ours, because they wanted to win. Lol! We drove around a little more and then headed to a cigar and rum shop. 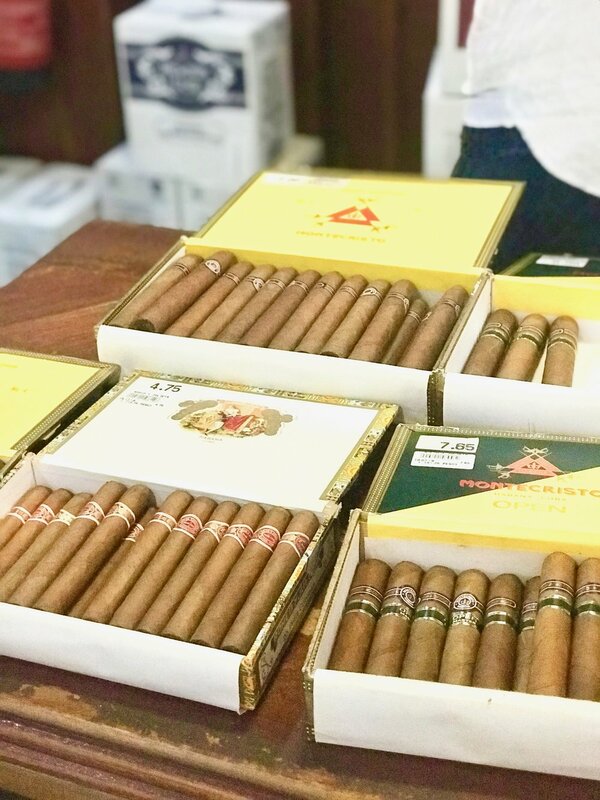 This was easily John’s favorite part of the trip and I swear he bought the whole cigar store. It was so interesting to see all of the choices, because obviously we still can’t get them in the states. Michel also taught John the proper way to light and enjoy a cigar— too cool! We made another pitstop at the Floridita bar, to see where Ernest Hemingway hung out. The place was PACKED. We could barely get in the door it was so busy. Everyone in the bar was drinking Hemingway’s signature drink. It looked delicious, but seeing as I couldn’t even move, we didn’t stay too long… although it was really cool! Our tour ended at a traditional cuban restaurant called Draquecitos. We said our goodbyes to Michel and Maykel and had a traditional Cuban lunch, complete with a Cuban beer and a tiny taste of Cuban Rum. We signed the walls and headed back out to explore. We walked around even more, took a ton of pictures and then stopped for a mojito! 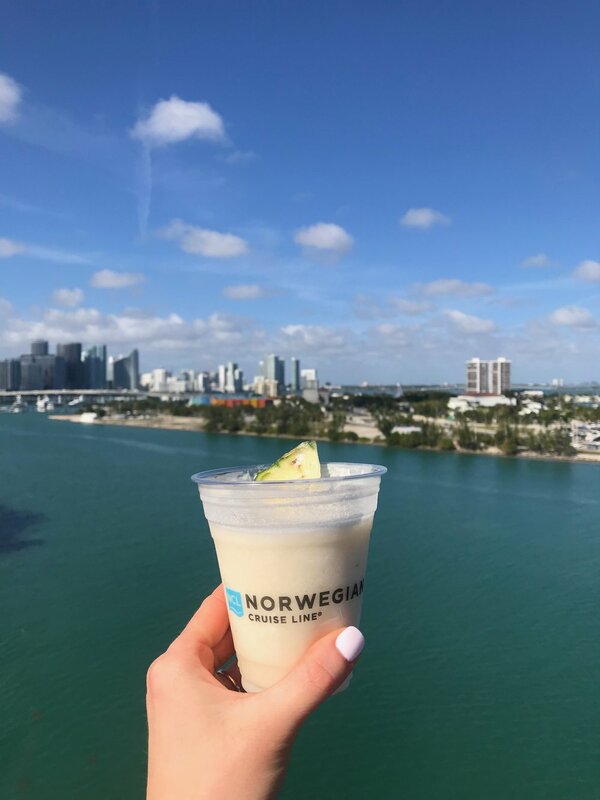 The mojito originated there, so there were amazing— of course! So, we usually walk and explore and take photos and then end up getting so tired that we have to stop and get a coffee or a drink or some food… and then we walk some more! We stopped at Cafe el Escorial and grabbed an Americano and people watched. This is one of the most well known coffee places, and is in the cutest little piazza. We explored some more, walked around by the capital, but most things were closed for the New Year. 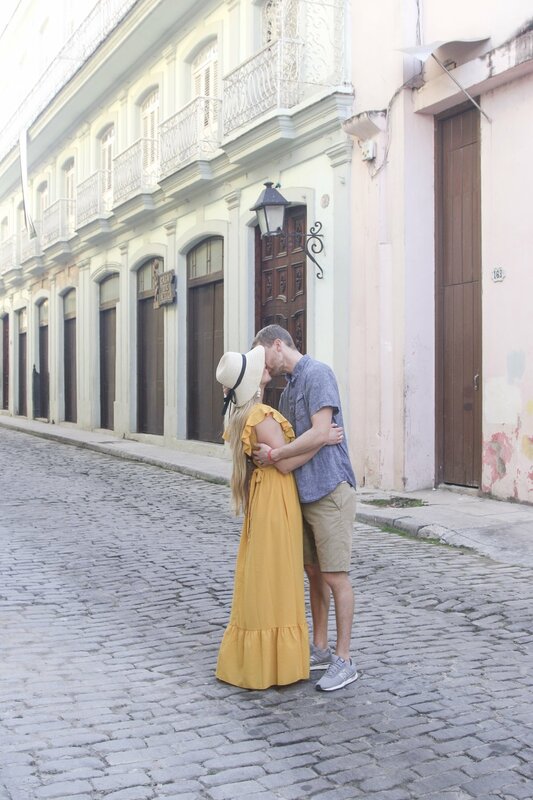 Overall, our short time in Cuba was so much fun— and so very interesting! 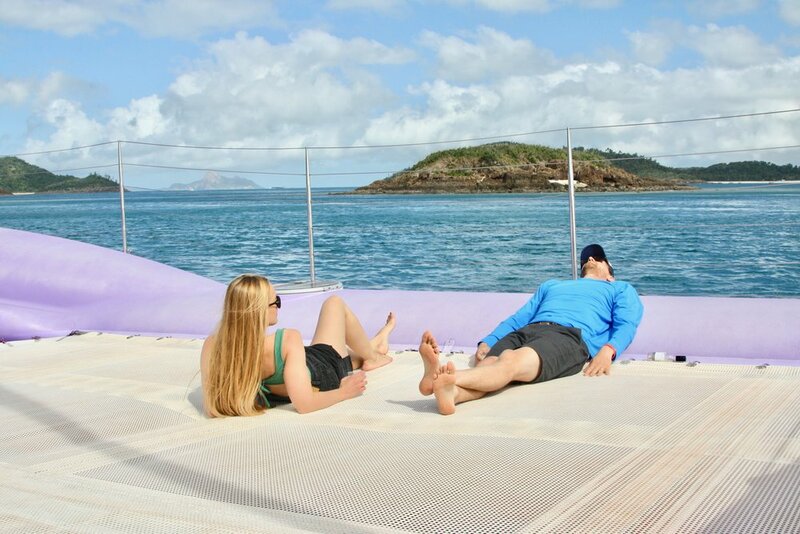 If you’re looking for a relaxing, yet adventurous trip, taking the cruise is the perfect way to get both. We loved every second. If you have a chance to go, definitely get a hold of Michel for a tour! 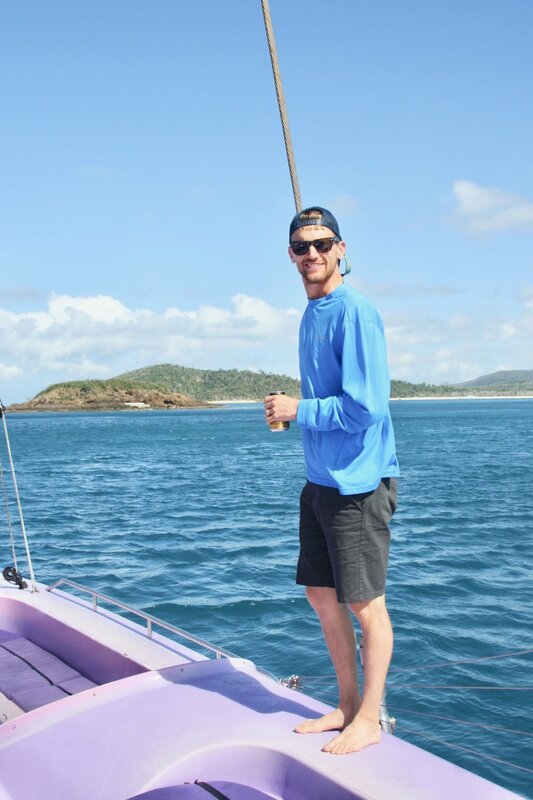 His email is bestwaytourscuba@gmail.com and his website is here! He was so knowledgeable and we loved our tour! Credit cards, debit cards, any kind of card will not work in Cuba. If you are going, be sure to take enough cash to exchange for your whole trip! Our dollar is basically equal to their dollar (CUC), but there is a pretty hefty fee to convert USA $ to the CUC. The exhange rate is more favorable to Canadian dollars or to Euros… so if you can, exchange at home and bring all Canadian dollars to exchange to CUC in Cuba. Definitely not ideal to have to convert your money back and forth so many times, but you gotta do what you gotta do!… and of course we procrastinated until the day before and couldn’t get Canadian dollars or Euros in time before we lefts, so we had to eat about $40 every $300 to switch USA $ to CUC. Not terrible, but not great. You do need a Visa to get into Cuba. It costs about $75 per person. You can get one through the cruise line or here. If you get hungry easily, bring snacks because there aren’t any convenient markets around! If you’re like us and walk a lot and start getting hangry before your next meal, bring some protein bars, or almonds to tide you over! We didn’t see one mosquito, but according to the CDC there is Zika in Cuba, soooo put your bug spray on. We use this kind and it’s literally like a shield and no bugs come close. I usually get eaten alive, but this type is travel size and amazing … Shop it HERE. Hope this helps! 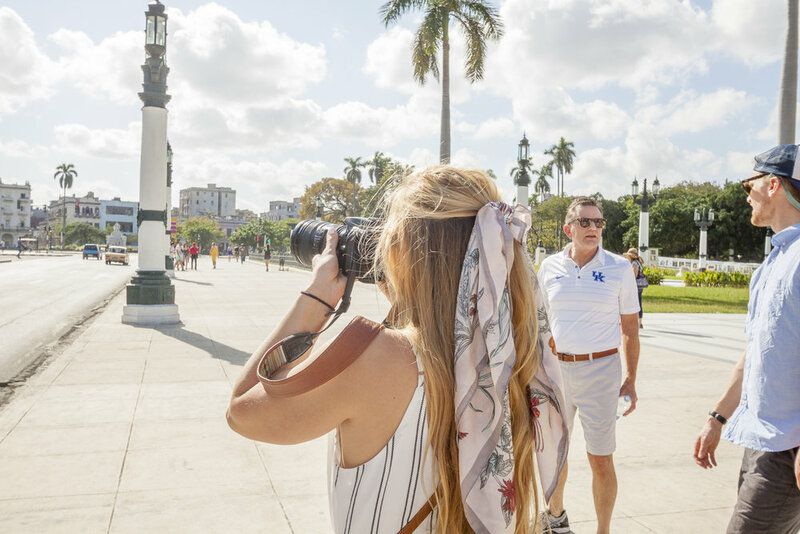 Literally this was the easiest trip ever… mostly because it was a cruise… but also because the Cuban people were so nice, accommodating, and kind. I highly recommend going before it becomes like all the other tourist traps! It is still so authentic and stuck back in the 50s. Happy traveling!! Hey there! Finally got around to doing this! I swear I am busier now than when I was teaching because I keep adding more and more to my plate! WHAT IS WRONG WITH ME!?! haha! Anyways, let’s get to the reason why you are here-- Australia + New Zealand!! One of my goals in life was to visit every continent (except for Antarctica-- for now ;) ...) before I turned 30! 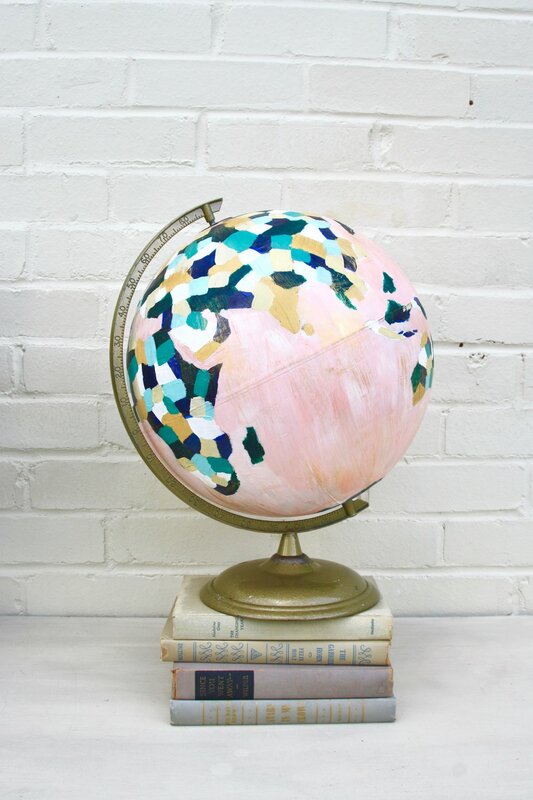 I really wanted a broad view of the world, so I decided it would be a good idea to get to each part of it! I also have a world map tattoo on my wrist... so I totally had to go to every continent!! Our last continent on the list was Australia... so that's why we decided to go there for Summer 2018. Our planning process began around April-- well, that’s when we bought our flights. Ahem, the actual planning-planning began a week before leaving. I know... I know. Crazy, right? You all know I am a huge procrastinator, so I kid you not, we didn't have anything but the plane tickets purchased until a week before we left. 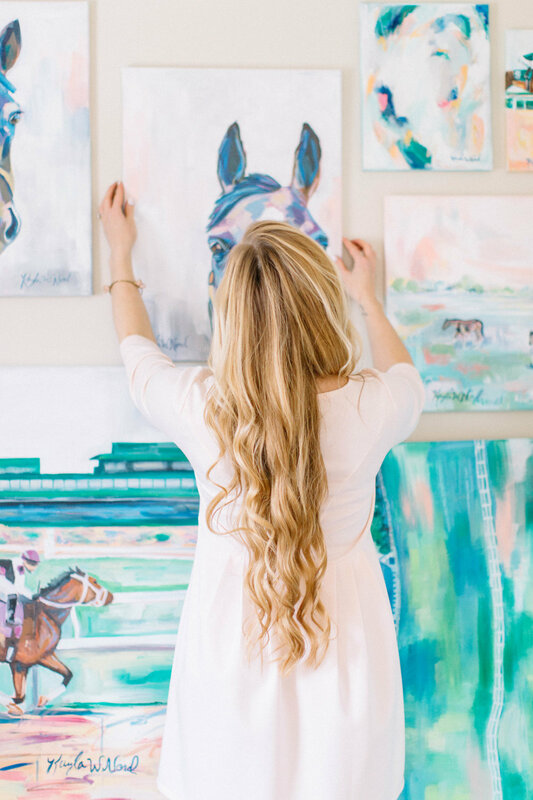 With school, weddings, live paintings and art I literally didn't have a second to put towards it. We didn't even know where we were going in Australia/NZ except for we knew we were flying into Sydney and then leaving from Sydney three weeks later! I'm sure I'm making some of you all sweat by now, but that's just how John and I both operate... The majority of our trips have been like this and I think sometimes less planning turns out better— if you’re a pretty seasoned traveler! 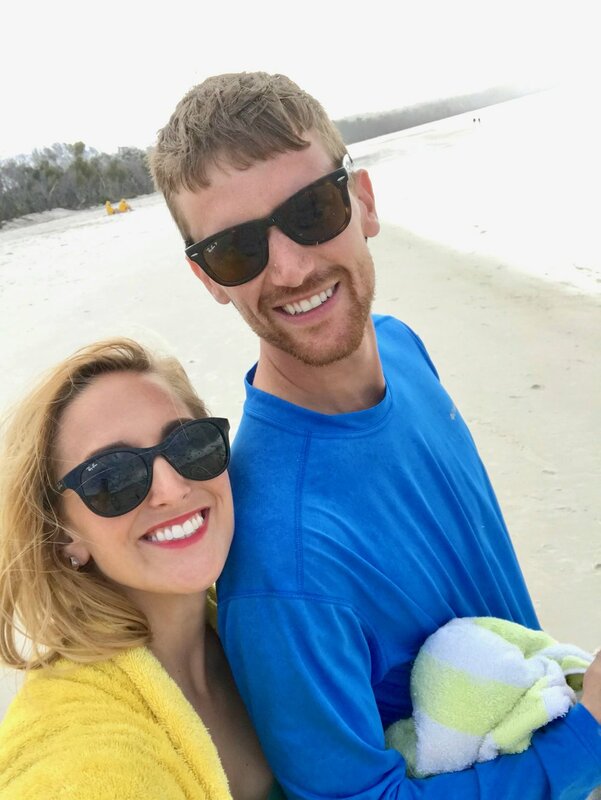 Our first big month long European trip together was very well planned out, but now we know how we travel together and enjoy just going with the flow. So… the week before we left, I finally sat down and decided where exactly we wanted to go and then made John do the logistics on how we were getting to each place. Once we figured out where we were going and how we were getting there, then I could start planning our hotels, airbnbs, and activities! Honestly, the hardest part was deciding what we could fit in and where was most important to us. I chatted with people who had lived there, looked at blogs, and stalked instagram for the most beautiful places. 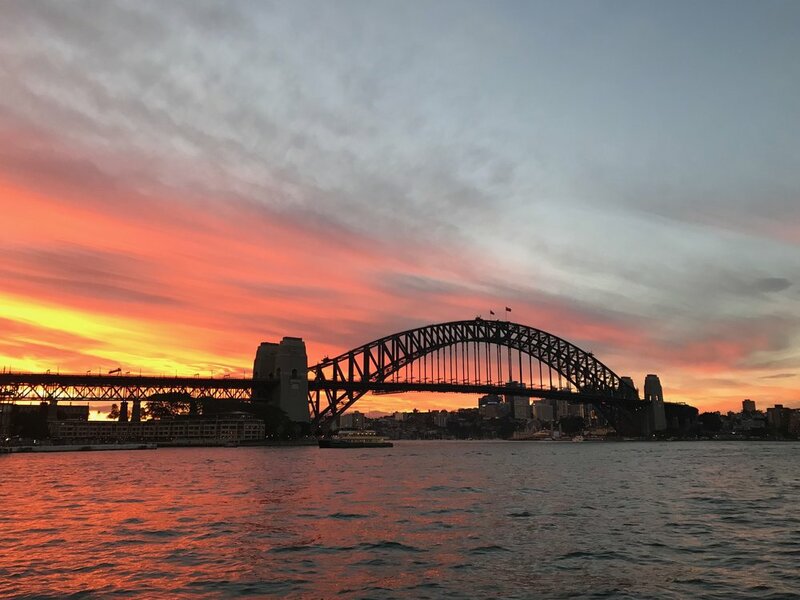 We finally decided on Sydney, followed by Queenstown (NZ), then back to Australia c/o Brisbane and Whitsunday, before a road trip to Cairns, and then finishing back in Sydney. We made the decision to stay in Northern Australia since the seasons are flipped and we didn’t want to pack too many winter clothes. I always recommend at least 3 days in each city with a travel day in between, so 3 weeks really doesn't give you a ton of time. Especially since Australia is HUGE and spread out, so we had to cut out a lot. It's sad, but I would rather enjoy the places we get to go, rather than rushing through to hit everywhere and be exhausted at each place. It also makes your trip SIGNIFICANTLY more expensive the more places you add. Australia and NZ are already super expensive to get to and travel around. Something I always get asked is how much do our trips cost and how we budget. To be honest, we don't do a great job of keeping track of everything to the penny, but we definitely have a number in mind of what we think it will cost and an amount we don't want to go over. We always do things the cheapest way we can find, but it can still add up quickly if we're not careful. We definitely don't skimp on anything and enjoy ourselves, but don't do anything excessive or beyond our means. At this point in our life, travel is very important to us, so we save our money accordingly. But like I said, Australia and New Zealand are EXPENSIVE! Knowing this, we really tried to find the cheapest options for getting around. Our flights there were $1,500 per person round trip through American Airlines.. and yes that's economy... and yes it was rough. This was a huge expense up front that we paid for in April and got out of the way. That is actually one of the cheapest prices I have seen to Australia and I believe it was because we were going in June/July which is their winter. During their summer (Dec-Feb) prices are even higher! Luckily, we went in the off-season, so that helped! For going from city to city we opted to fly because we only had 3 weeks and wanted to see as much as we could. Australian/NZ domestic flights were not terribly pricey but ranged from $120-$350 each.. with the flight to NZ being $350. This adds up so fast. In the end, we spent about $1,500 each for flights within the country. ((Total cost of all flights was around $4,500)). One thing a lot of people don't factor into their trip planning is transportation to and from the airport in each city you are staying. That usually costs around $50 each way depending on if you taxi, shuttle, or bus. John is a big fan of the metro, so we try to save money by using that from the airport in bigger cities. 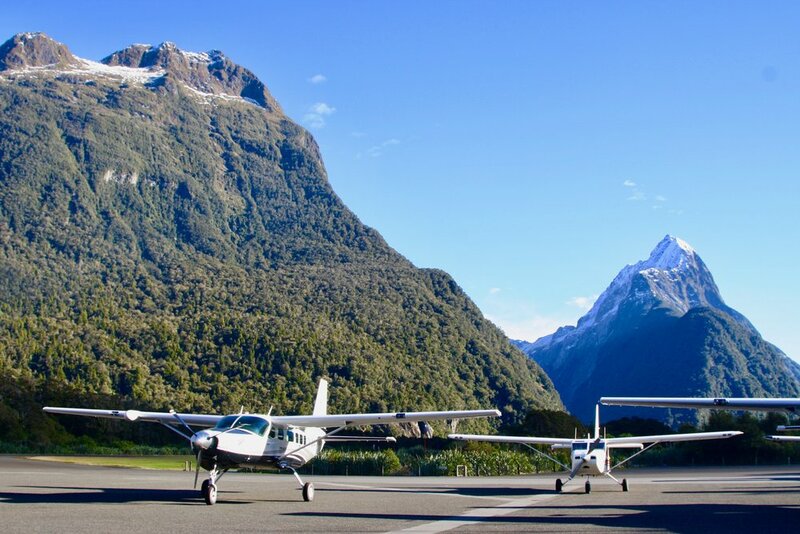 There is definitely a way to work the public transportation system, but sometimes that's not an option in smaller or remote destinations. Don't forget to budget for that! Traveling with luggage larger than a carry-on is also important to consider. We only bring one personal item and a carry-on bag apiece. This can be very hard when traveling for multiple weeks, but if you bring anything larger, you will get charged on every single flight. We use Amazon packing cubes found here to better organize clothes and fit more in our suitcases/backpacks. 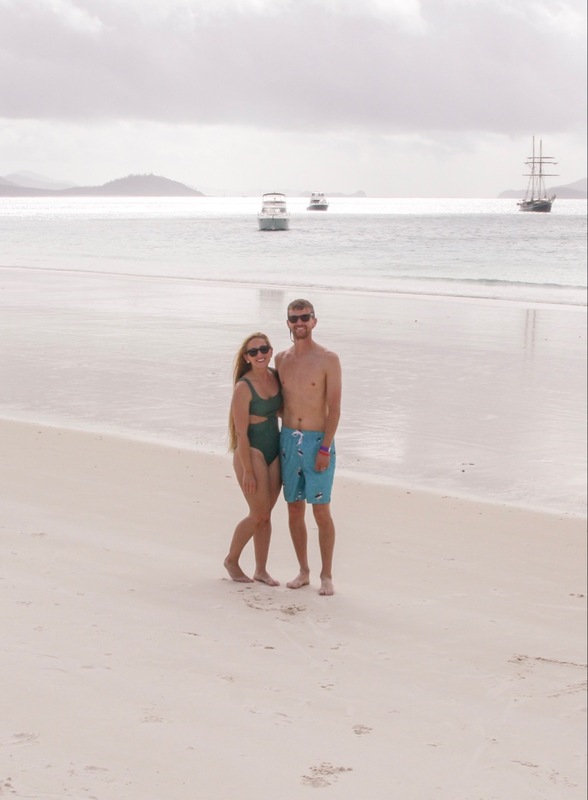 Since we would be in Sydney (60 degrees and chilly at night), Queenstown (30 degrees and freezing), and Whitsundays + Cairns (80 degrees and up), we had to do some crazy packing. We had to bring gloves, hats, scarves, a winter coat, light jackets, and bathing suits all in the same suitcase. It was wild! We brought suitcases this trip, but we usually bring 60L Osprey backpacks. Most airlines we flew didn't charge extra for the carry-ons, but there were a couple that did and I can't imagine how much it would have cost had we brought full sized luggage!! Also, always check your airline to see what their baggage policies are because it's usually cheaper if you pay ahead of time. 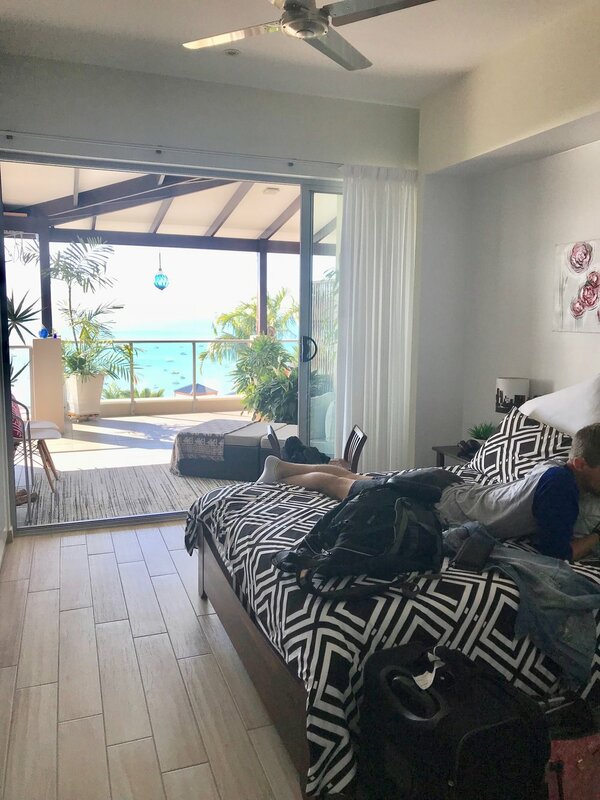 As far as rooms and hotels... we always go for hotels/airbnbs that cost around $50-$90 per night. In Australia and NZ, this got us some nice places but they were no Ritz Carlton's!! I think we spent around $1,500 total on rooms for the 21 days. We did a $30 hostel one night... mistake!! And then two nights we got for free by sleeping in our I-Moova campervan! Food in Australia + NZ is OUTRAGEOUS. Every time we ate out it was around $50 for 2 meals and 2 drinks. In the USA you can get a nice meal for $12ish depending on where you go-- or at least that's what I always try to spend on a meal. In Australia or NZ you can’t find a burger/sandwich for less than $19. It is insane. Same with beer/alcohol... most drinks are around $8+. This made it hard to find budget friendly restaurants. Even the grocery stores were super expensive. At one point we tried to find something quick, cheap, and easy so we thought pizza.... for a big enough one to fill John up, it would have been $35!! SO CRAZY! With that being said, we definitely tried to find hotels/airbnb's that included breakfast or had a kitchen, so we could cook and save some money. We also tried to only eat 1-2 times per day. This was tough, but you gotta do what you gotta do! I always pack protein bars, almonds, and travel sized peanut butter to eat throughout the trip and hold us over until our next meal. We probably spent around $1,750 on food and alcohol. Another thing to account for is activities! 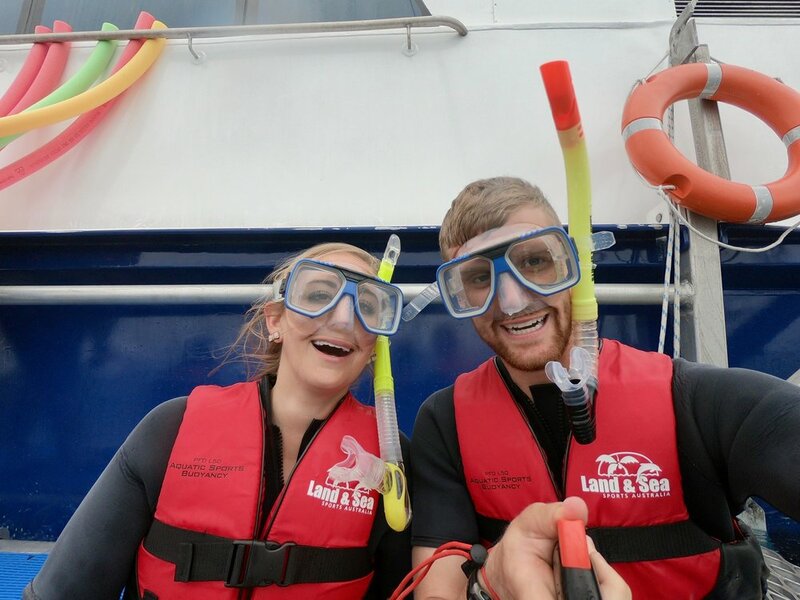 We went bungee jumping, sailing in the Whitsundays, scuba diving in the Great Barrier Reef, to an animal sanctuary in Townsville, and took a flight to Milford Sound in NZ! Even after all that, we still had things left on our list that we wanted to do! But all of these things add up fast, so you have to figure out what is most important! John and I hardly ever buy souvenirs, except maybe something small or meaningful like jewelry. We only travel with a backpack or a small carry-on, so there really isn't much room for extras. We flew from Louisville, Kentucky, to Houston, Texas, and then from Houston to Sydney, all on American Airlines. The flight length to Sydney was 17 hours straight. 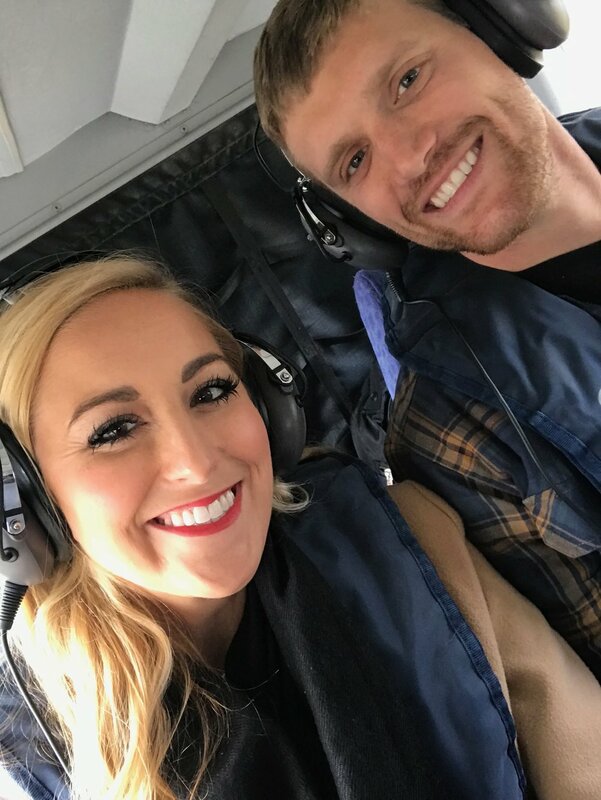 I was a little apprehensive about the flight, especially because John's body is too long to sleep comfortably on a plane, so we were pumped to find out the flight was under-booked and that we had a row to ourselves! We stretched out as much as you can in a row of airplane seats and were actually able to sleep a lot of the flight. 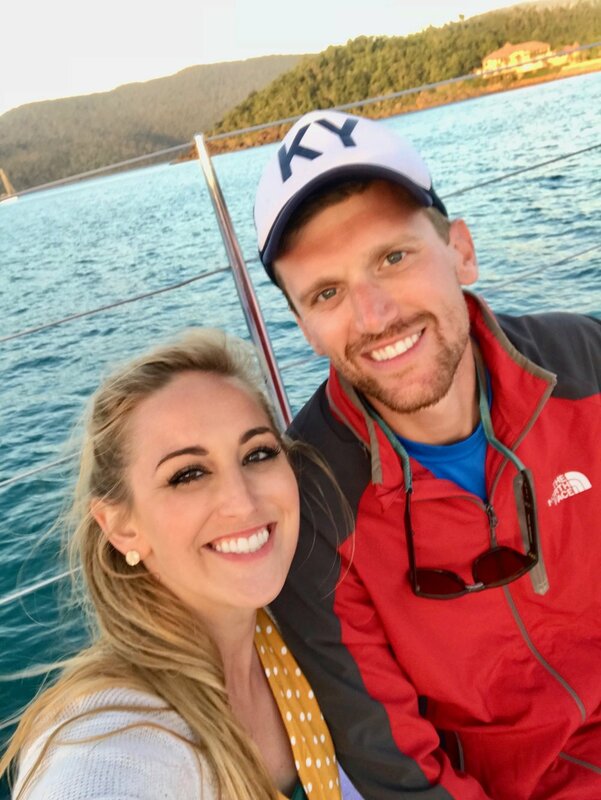 We left Louisville on Monday and arrived in Sydney Wednesday morning.... not sure where Tuesday went, but who needs it anyways?? We landed at 8:00am and headed to our boutique hotel that was located right in the heart of The Rocks area. I would highly recommend staying in this area as it is central to everything! The Mercantile Hotel is super basic and was the cheapest thing I could find in the area at $88 per night. The staff was friendly and it had everything we needed, including free breakfast. The hotel is on top of an Irish bar, so if you're a light sleeper-- might not be a good choice, and keep in mind, the bathroom is a shared one. But other than that, we really liked our stay! 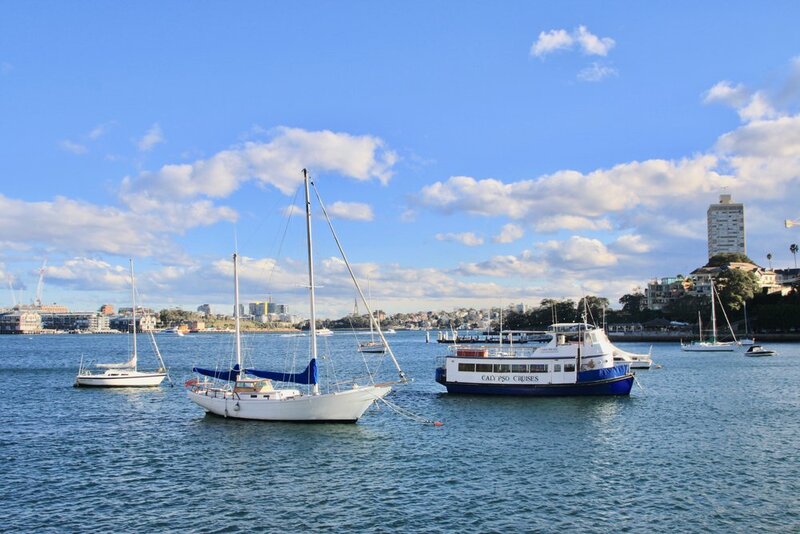 -Museum of Contemporary Art…MCA Café and Sculpture Terrace—head to level 4 to eat with amazing views of opera house and Sydney harbor bridge. 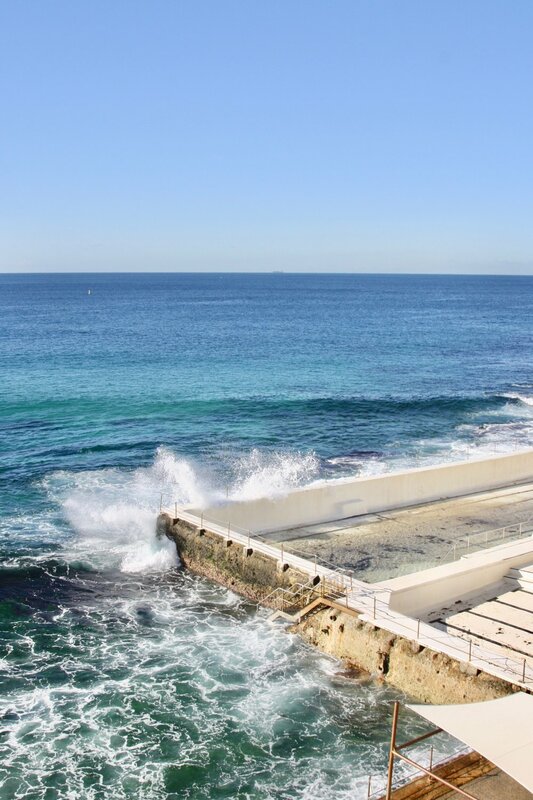 -Wander through The Rocks… on the weekends there is a huge outdoor market! 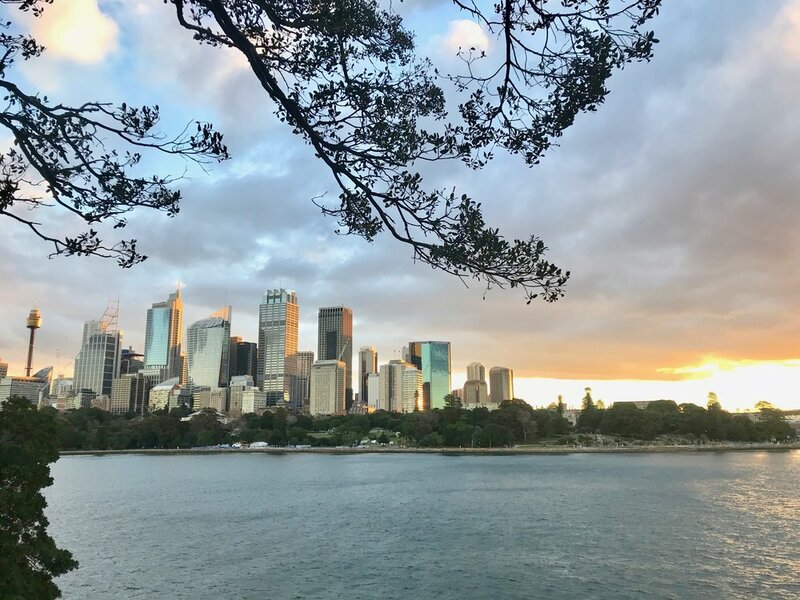 -Have a picnic at the royal botanic gardens… walk to the top of the hill for panoramic views. View from the Museum of Contemporary Art. View from Sydney Harbour Bridge. 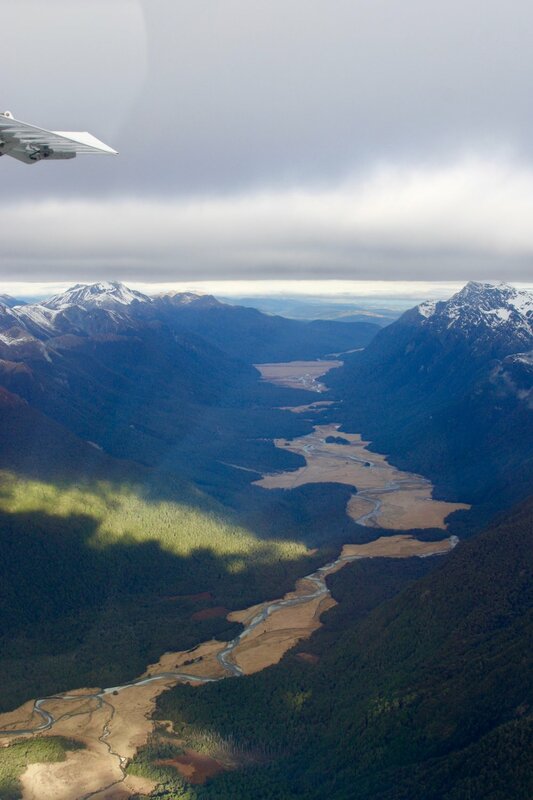 We flew to Queenstown, New Zealand, next through Jetstar. The flight took 3 hours and we lost 2 hours on the way there. Our flight got in kind of late and luckily we grabbed the last shuttle bus that dropped us off directly at our accommodations for the night. The bus was $20 for both of us, but a taxi would have been $50. We stayed at the Melbourne Lodge and it was perfect. Breakfast was also included and it was centrally located! We found an even cheaper airbnb and ended up switching to it for the remaining nights in Queenstown. We loved Vickie’s place, and although it was super small, it was all we needed! Find Vickie’s airbnb here. -Go bungee jumping!! 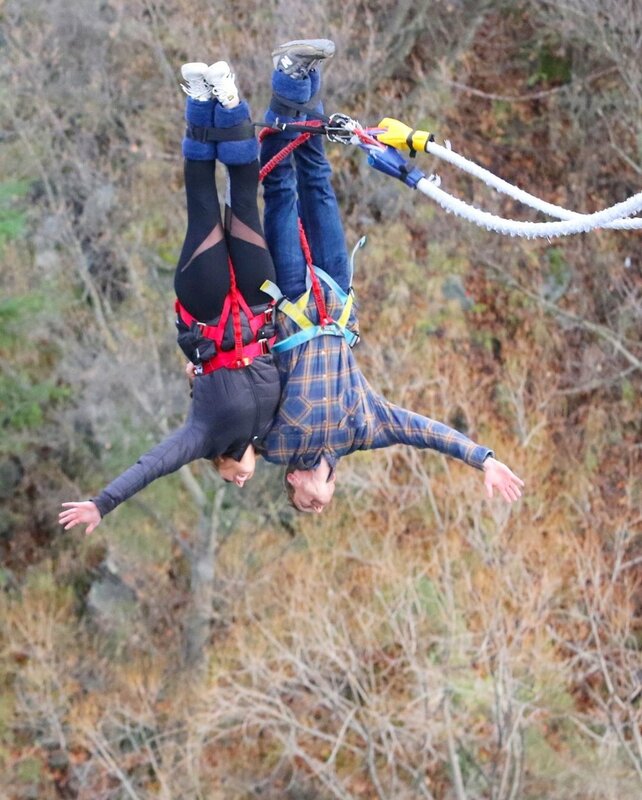 Tons of places to choose from— we did the tandem Kawarau Bridge Bungy. 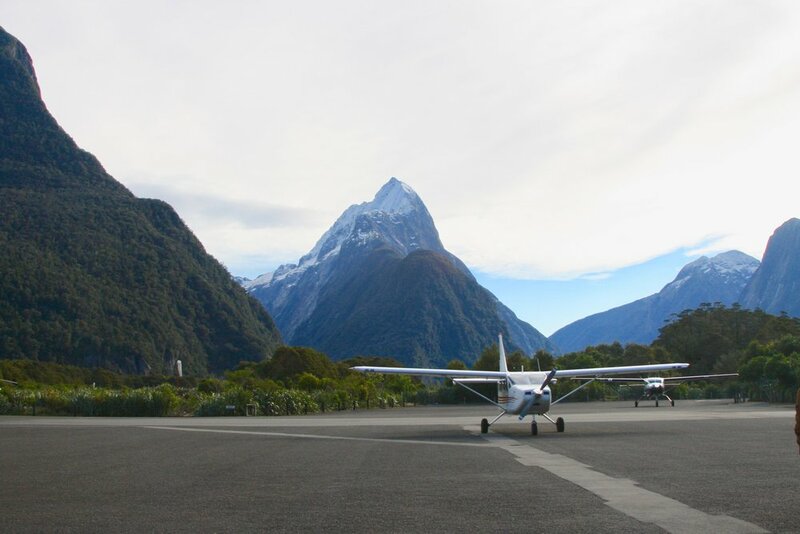 -Go to Milford Sound— we took a 30 minute flight because the bus ride seemed like a lot of time wasted! 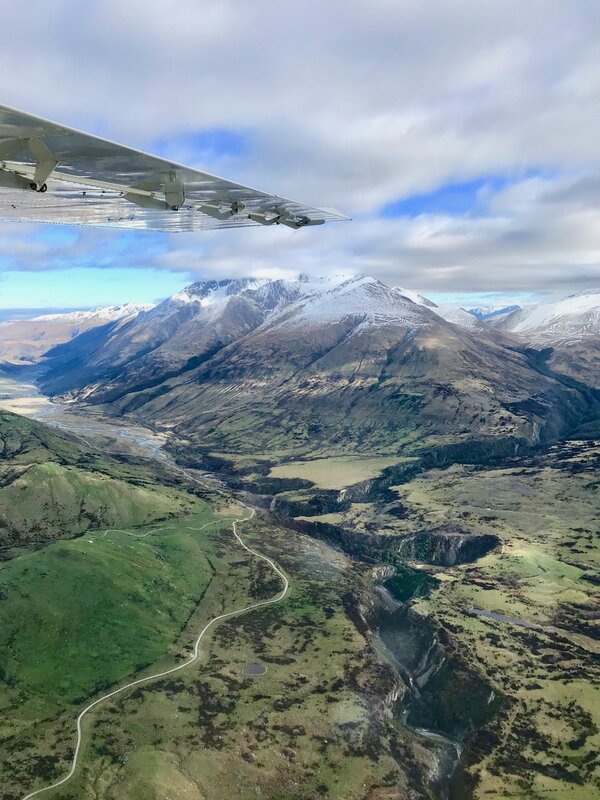 The flight was amazing— a little scary, but INSANE views! After New Zealand, we flew to Brisbane, Australia, on a Qantas flight. It was a great flight— they gave us a meal and drinks and it took around 3.5 hours… we also gained 2 hours going back! John had a Skype interview that morning, so we didn’t get to do any exploring in Brisbane but we splurged and booked a room in an AMAZING hotel by the airport called The Pullman. There weren’t any good flights from Queenstown directly to the Whitsundays, so we had to fly to Brisbane and then fly the next day to Prosperpine (NOTE- if you aren’t a millionaire, fly into Propserpine instead of Hamilton Island for the Whitsundays— we booked flights to Hamilton and then realized there aren’t any accommodations under $250 per night and to get to Airlie beach the ferry is $$ too!! We had to switch our flight to Prosperine after we realized that!). Our flight the next day was through Virgin Australia and only took about an hour and a half. We arrived and had pre-arranged for our Airbnb hosts to pick us up! 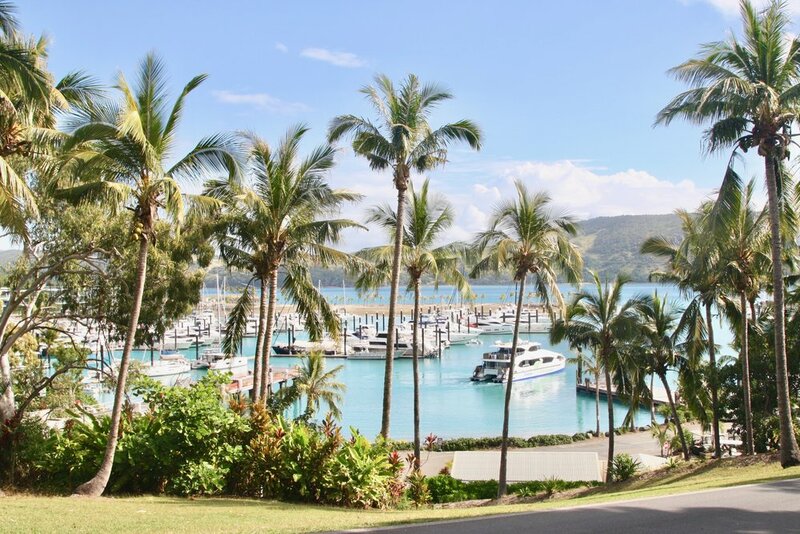 The Prosperpine airport is about 30 minutes from Airlie Beach in the Whitsundays. The shuttle costs around $22 per person to get into Airlie, so we opted for Glenda to pick us up. We stayed with Glenda & Ernie in their INCREDIBLE penthouse. It was BY FAR the best airbnb we’ve ever stayed in and at $90 a night, it seemed like a steal. 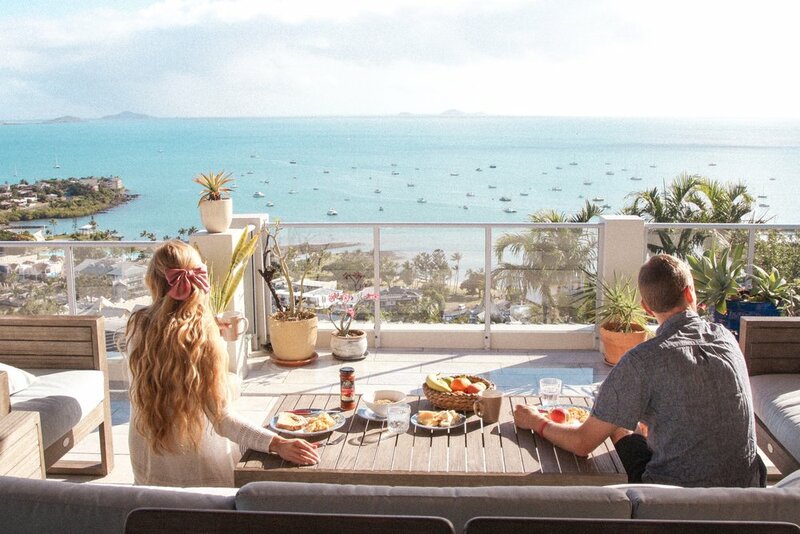 If you go to the Whitsundays, you must stay with them and let them know we sent you! They were basically like our Australian parents!! The hospitality was incredible… they cooked for us, hung out with us, and truly made us feel like we were family. Not to mention, their home was impeccable and the views were unbelievable. 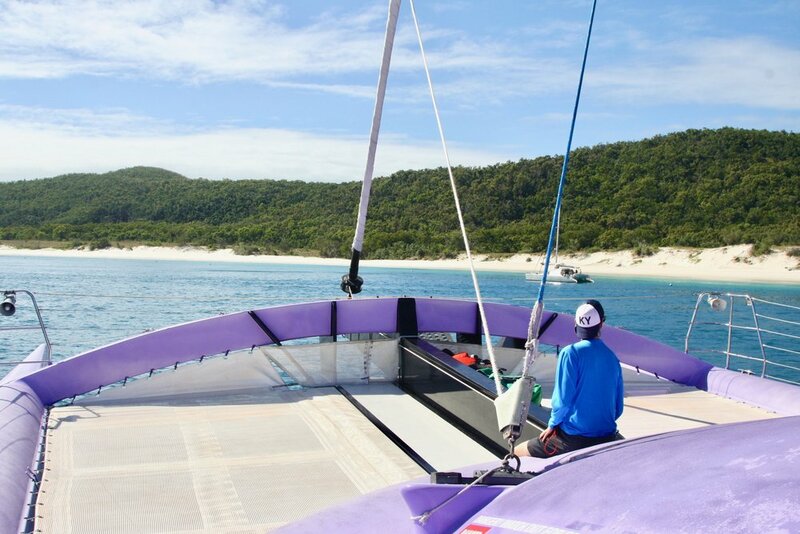 -Cruise through the Whitsundays on a sailboat… we went on the Camira (big purple sailboat) and LOVED it! -In our case, spend a day relaxing at the Airbnb! Rooftop pool and incredible views… we didn’t have to leave! 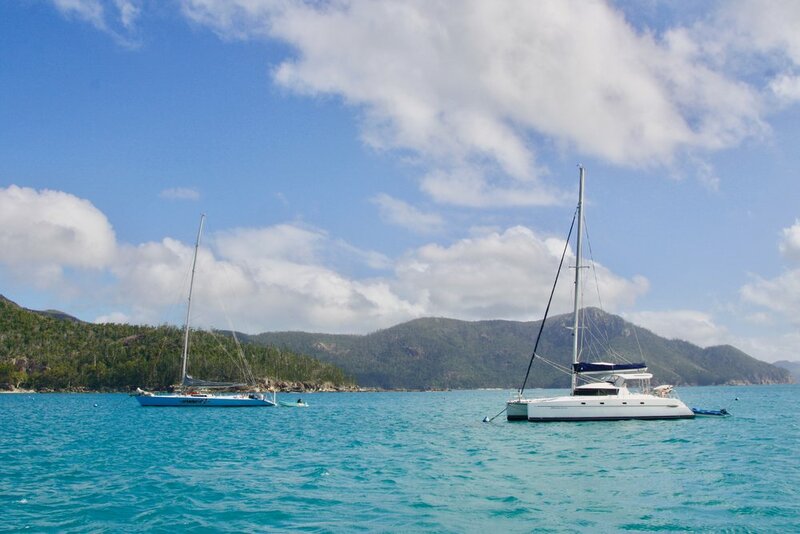 -Take a boat to Whitehaven beach— one of the most beautiful beaches in the world. The outdoor rooftop kitchen at our Airbnb + breakfast with a view! John and Ernie reenacting John learning how to drive the manual campervan!! 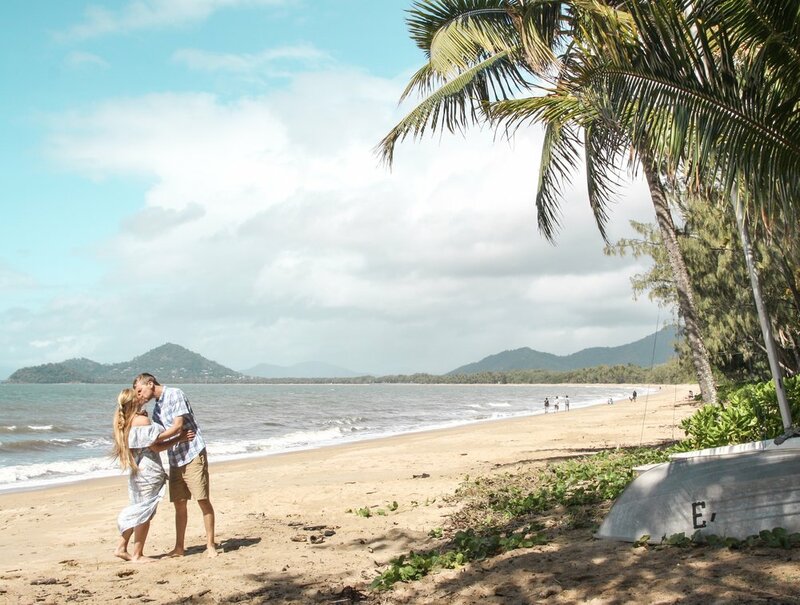 After Whitsundays, we decided to road trip up to Cairns. We didn’t really have a plan at this point and actually ended up staying with Glenda and Ernie an extra night while we sorted out the car situation. We got the bright idea to rent an Imoova campervan that needed to be moved to Townsville. Imoova is a company that basically pays you to move cars to different areas where they are needed. We got the campervan for 3 nights with bedding, gas, and everything for $23. So it basically saved us 3 nights of stay, gave us a place to cook, and our transportation for twenty three big ones! …. The only problem was it was a manual driver… and neither John or I knew how to drive one of those. HA! 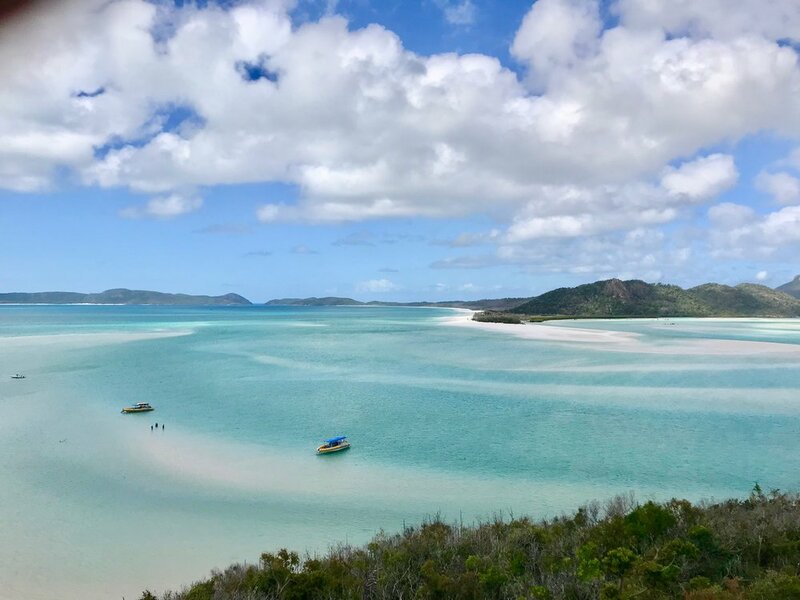 With the encouragement of Ernie and Glenda— we decided to go for it anyways because it is “easssyyyy, no big deal!” … SO, we rented the dang thing (would cost $775 if we didn’t get it to Townsville within the 3 days) and set out to learn how to drive it…. on the opposite side of the road… on the opposite side of the car. WHAT WERE WE THINKING. After an hour and a half of perseverance, patience (on everyone’s part), several near death experiences, stalling every three seconds in rainy— terrible road conditions, and a lot of circles around a parking lot, John (kind-of) figured out how to drive manual. As always, I had faith in John and we ended up making it to Townsville and camped there for a night at one of the many camper lots. It was DEFINITELY an experience… my knuckles are still white from clutching the “oh sh** handle!! * LOL. Our first road trip stop was Bowen. It was a beautiful little beach town with some awesome lookout spots and great hiking. We grabbed a coffee and hiked along some of the trails here. iced coffee came with a scoop of vanilla ice cream! 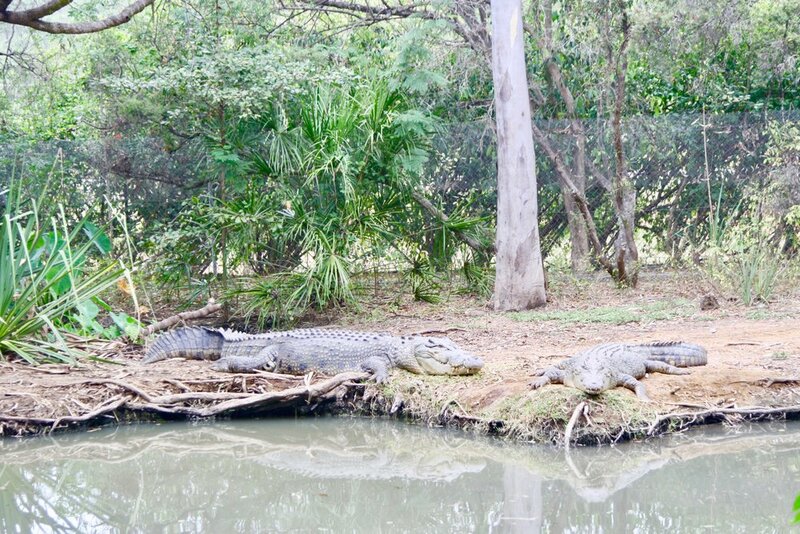 Townsville was our next stop (3 hours from Airlie) and we went straight to the Billabong Sanctuary to see all of the kangaroos, koalas, crocs, and wombats! We then ended up camping in a campervan lot that was close to where we were dropping off the campervan the next day! After we dropped off the van, we had to walk to a car rental place and rented a small car to drive the rest of the way. We tried to find another Imoova, but nothing was available. I’m just happy we made it to the place we were supposed to in one piece!! LOL. We grabbed breakfast while we waited on the car and then we were on our way! We stopped at random places during the drive and ultimately stayed in Mission Beach. It was a rainy day, so we hung out at a couple restaurant bars, played cards and then worked on finding a place to stay. We were pretty tired after our traumatic experience the day before… so we found a cheap hostel to stay at. It’s always at this point in our trip that John starts to PANIC about money, so the hostel for $30 that night seemed like a good idea. BAD. BAD IDEA. I wish I had taken pictures… lol no I don’t… I’m actually still trying to block that night out of my mind. Mission beach was a cute little town though… and if we hadn’t spent all our money at this point I would have definitely gone skydiving here!! 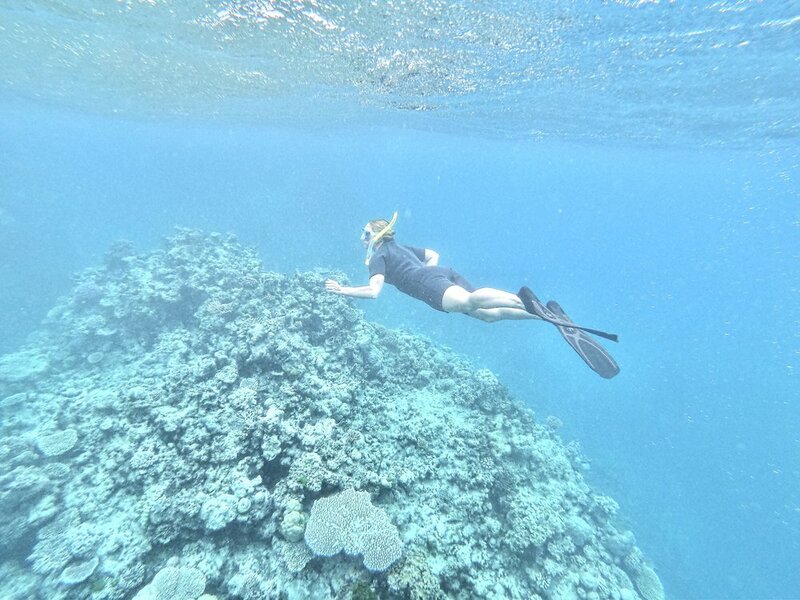 -Scuba Dive or Snorkel The Great Barrier Reef… we went through the “Reef Experience” which included both scuba and snorkeling— AMAZING experience! Highly recommend! -Ride the skyrail cableway or drive to the town in the rainforest called Kuranda… we drove! After Cairns we flew back to Sydney for our last night in Australia! We stayed at the Felix Hotel because it looked awesome, was $88 per night, and was close to the airport! 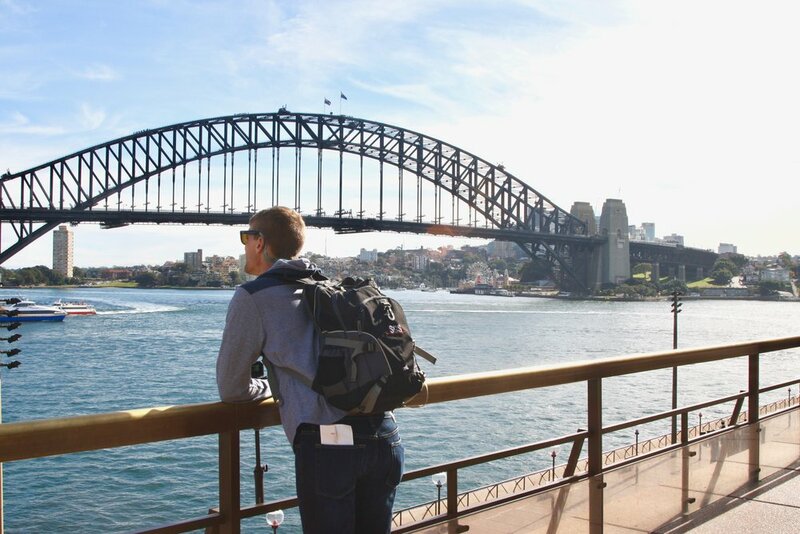 We ended up taking the metro into Sydney and spent our last night walking through the market, eating at our Irish Pub in the bottom of the Mercantile Hotel, and then had a drink at The Opera Bar while admiring the Opera House one last time. Our trip was absolutely amazing and I crossed off SO many things from my bucket list!! 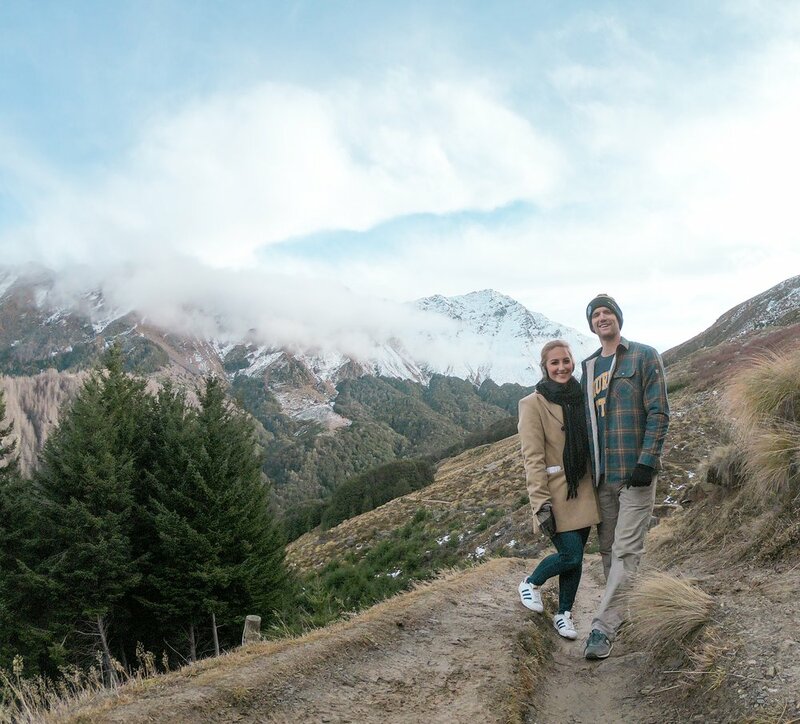 We loved Australia and New Zealand and only wish that we could have spent more time in NZ!! I hope this inspired you just a little to visit this area of the world! Happy Friday, friends! 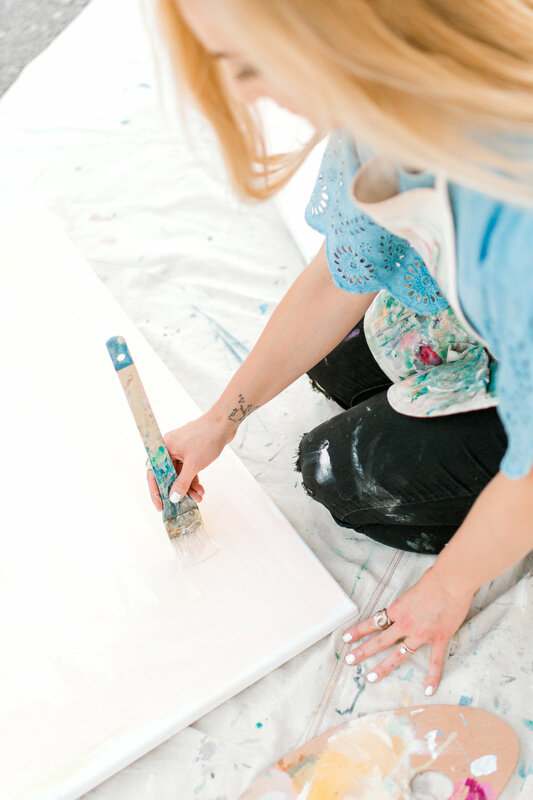 This blog post has been in the process for a while, but like always I never can seem to find the time to write them! My eternal summer starts today and my last official day of teaching-- so you can expect to see way more blog posts from now on. I wanted to provide a quick guide to our 9 day trip in Colombia and show you all how AMAZING it was. We flew from Lexington to Atlanta (picked up our friend J.J. on this flight) and flew directly to Cartagena. It was LITERALLY the easiest flight of my life. I barely got comfortable before it was over... and on international flights you get drinks, movies, and food ( I actually really love long international flights). Anyways, it took 3 hours and 45 minutes to get there from Atlanta. 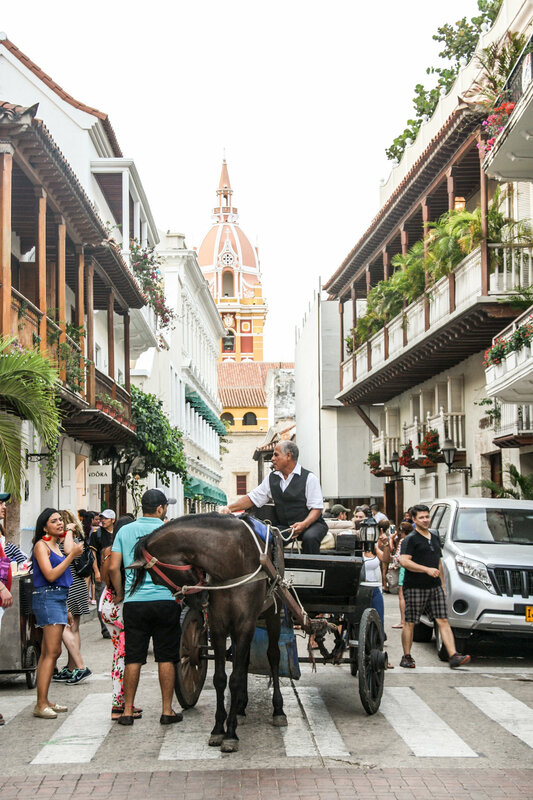 We left from Lex at 6:00am and we were exploring the perfect streets of Cartagena by 1:00pm. So crazy!! There is only a 1 hour time difference-- literally the easiest trip ever. If you've never seen pictures of this place, just wait. You're going to fall in love with it! 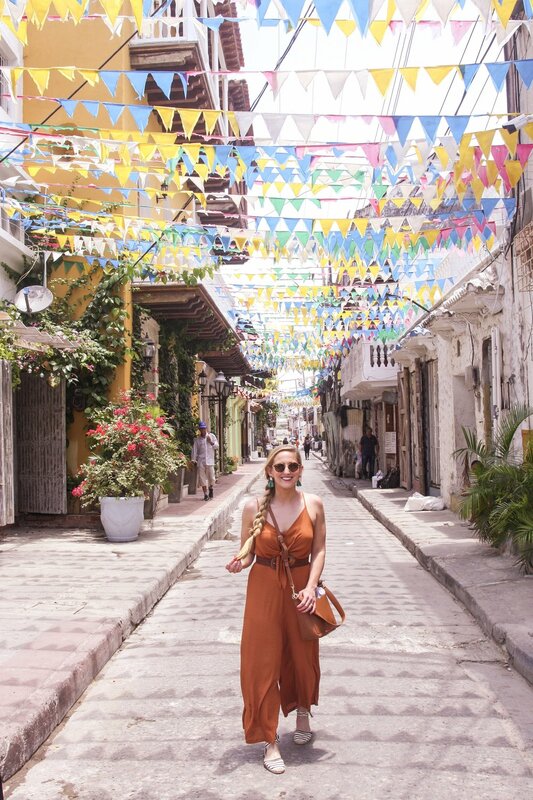 I will keep this guide short and sweet, but packed full of pictures, because every street and corner you turn is another picture worthy photo-op. 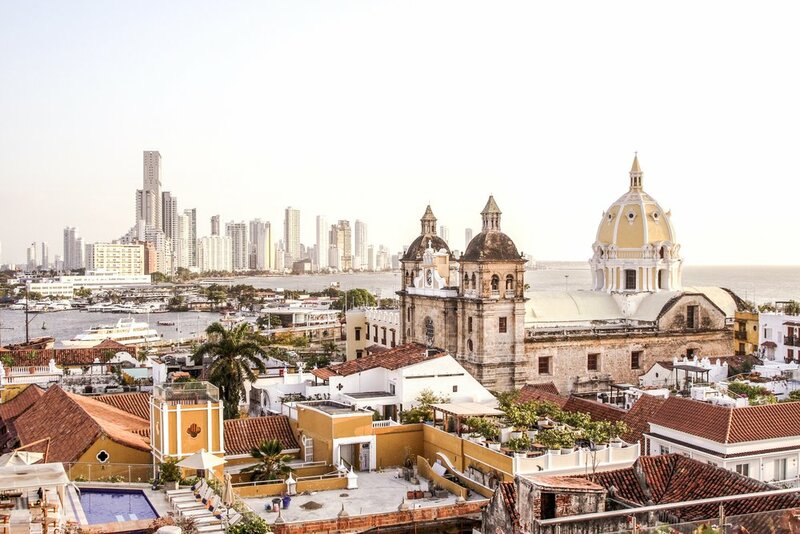 If you go anywhere in Colombia, my suggestion would be Cartagena. It is the cutest little town, full of vibrant colors, wonderful people, and amazing food. We stayed at this Airbnb here. It had everything we needed and was in the perfect location. It even had a beautiful rooftop area to hang out and watch the sunset. Definitely stay inside the old city wall, because everything is walking distance from there. We also felt super safe there too! 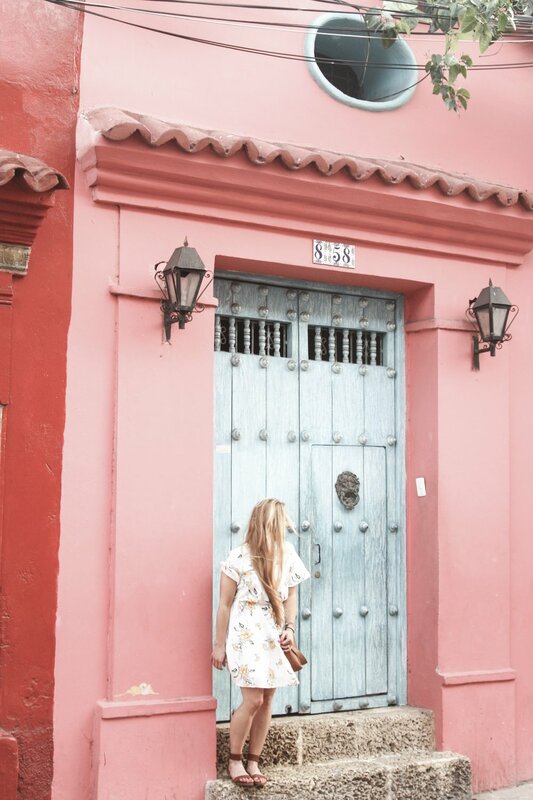 There is no shortage of things to do around Cartagena, my favorite being walking around and taking in the scenery. John an I are very casual travelers and find that we enjoy ourselves the most when we just immerse ourselves in the culture (basically we grab a drink in a pretty place and people watch!). 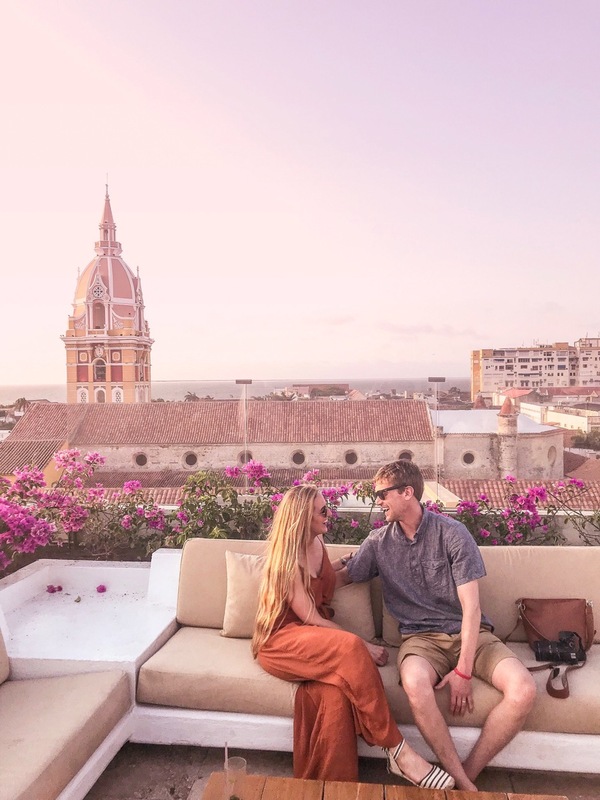 Here are a few things we did in our 5 days in Cartagena-- I could have definitely stayed longer, and I know we will be back again in the future. 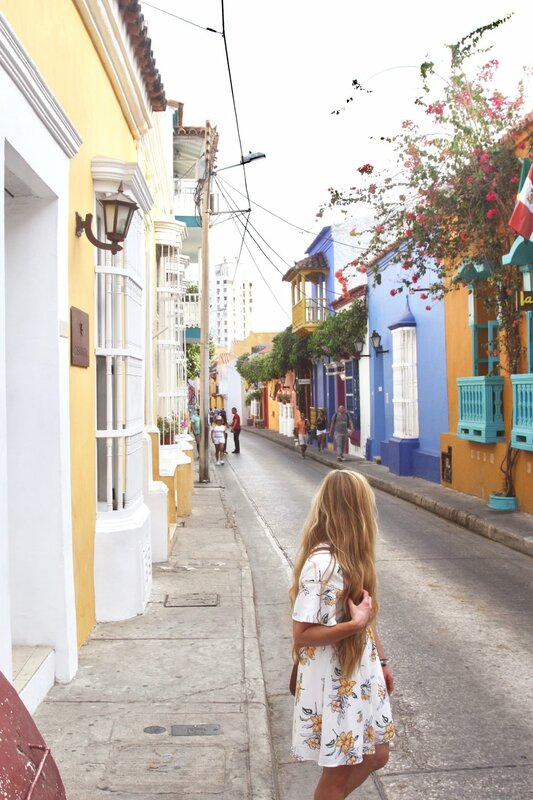 -Walk around and take in the sights + colorful buildings + flowers! -Walk along the City Wall. -Watch the sunset at Cafe del Mar. -Explore the Castillo de San Felipe. 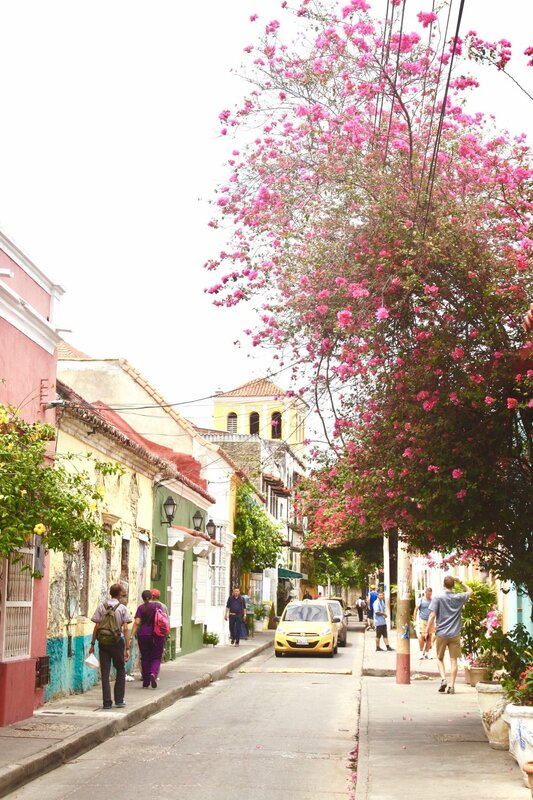 -Explore the art district of Getsemani. -Head to Getsemani at night and eat street food, people watch, and listen to live music in the plaza. -Get drinks and watch the sunset on the rooftop of the Movich Hotel-- it's the best view of the city! -Take a boat excursion to Isla Barú for the afternoon. -Go to Townhouse Rooftop for drinks! -Shop around the old town... tons of woven round purses everywhere! -Meet a Palenqueras or a fruit lady and snap a photo with them! After our stay in Cartagena, we decided to head to Medellín by flight. Our flights were pretty cheap-- I think they were around $120 per person and it was a super easy process. Upon arriving in the Medellín airport we negotiated a taxi driver to take us to Guatapé, a town an hour and a half away from the airport. It costed about 130,00 Colombian Pesos, which is about $45 USD. The drive was beautiful and I loved seeing the mountainous countryside of Colombia. Anyways, the view from the top was INCREDIBLE! 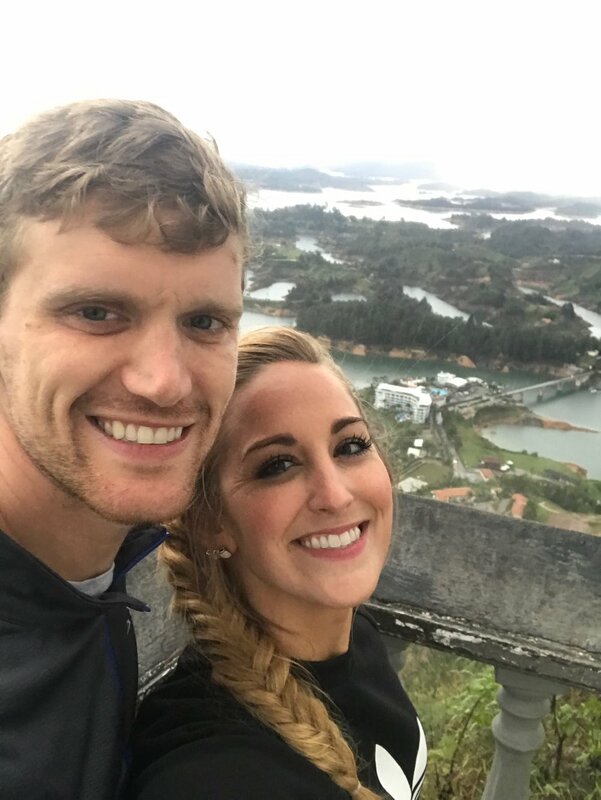 We were heading up to the top right as a huge thunderstorm was starting, so we had to wait out the clouds... but luckily it cleared up and we were able to see the view! It was breath-taking and not just from all the stairs!! I highly (pun intended) recommend this hike! We stay at the Hotel Los Recuerdos at the bottom of the hill (another huge hill that we actually climbed BEFORE even reaching the steps to climb up the rock). Nowwww, I wouldn't recommend staying at the Recuerdos resort and that's another story for another day. If I were to do it again, I would definitely stay in the Guatapé town. The next morning we took a personal cab to Medellín and paid $90 for hotel to hotel service and the 2 hour taxi drive! Before heading to Colombia everyone asked if we'd watched the hit Netflix series, Narcos... and of course we hadn't. That being said, my knowledge of Medellín was little to none, but something intrigued me about this city! We decided to go there over Bogotá. 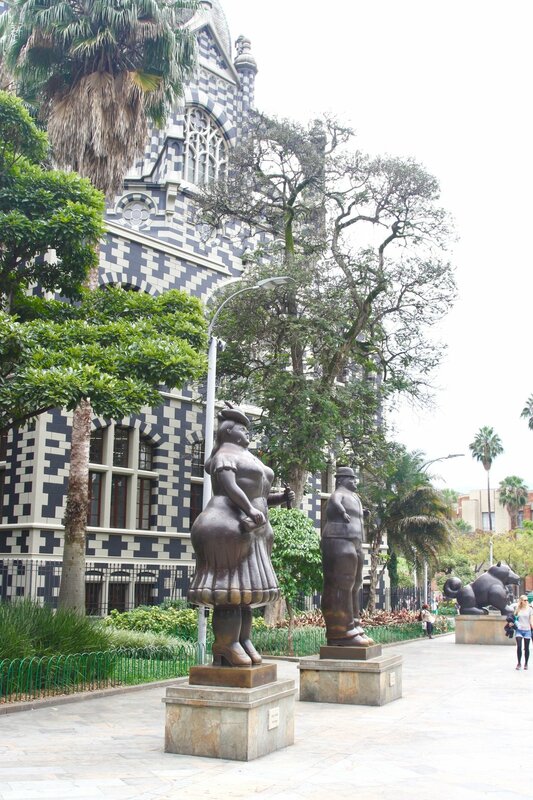 Medellín is such an interesting city, chock full of history and sadly, a very explosive past. It was once the murder capitol of the world during the reign of Pablo Escobar in the 80s and 90s. 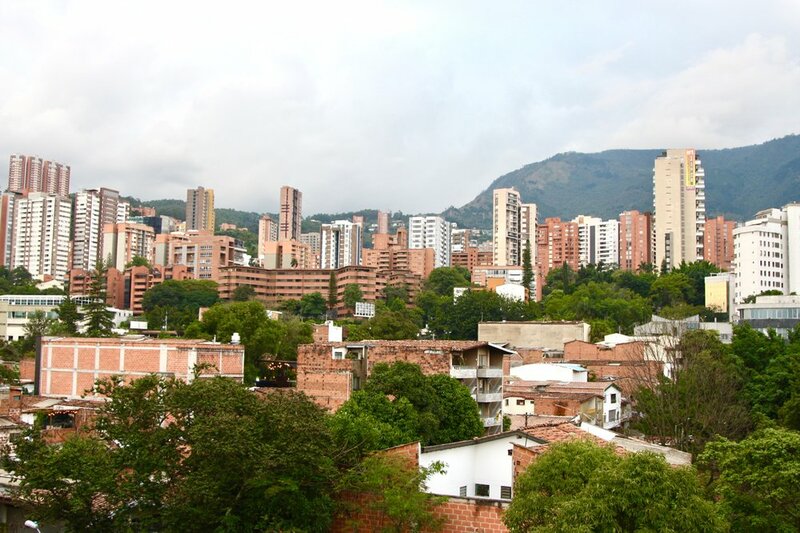 The city has come such a long way and we could tell that the "Paisas," or local people of Medellín, were so happy to see tourists coming to and enjoying their city. They were such nice people, very accommodating and happy to show off their home to visitors. They are so proud of how far they've come and it is reflected in everything they do. 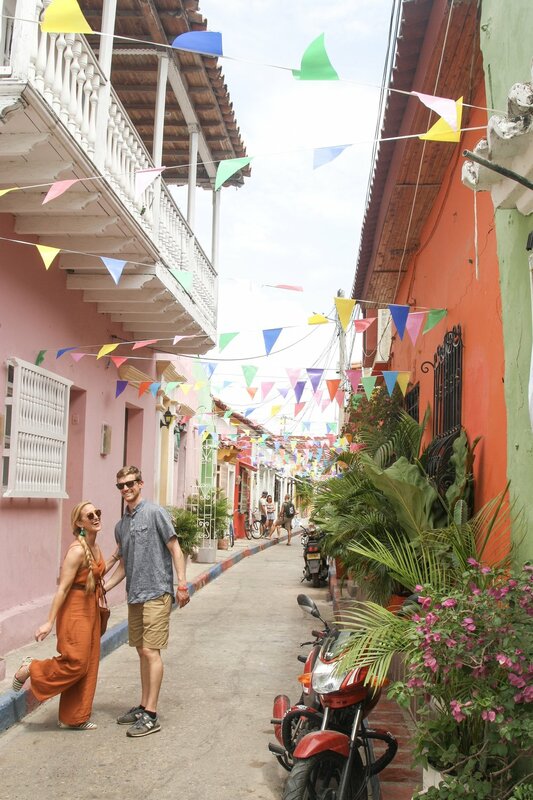 We stayed in the El Poblado district and loved it! There are tons of boutique hotels, fancy hotels and hostels in this area-- perfect for all budgets. It is also a really hip area with restaurants, shopping, and bars. Everything is very spread out in Medellín because it's a big city, but the metrocable helps connect all places. The metro was a huge success for the people of Medellín, because it was built in a time of extreme violence. It has since been a way to connect each of the barrios with the city. The streets of Medellín are very steep, so much so, that a bus system would not work in some areas. The metro helped people who lived in these areas have a way of transportation in to town. 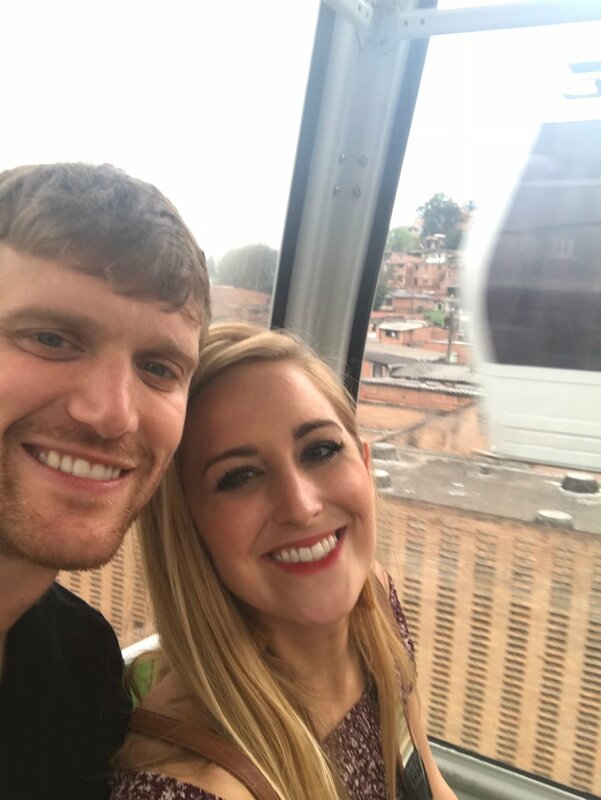 Today, it is the main way people get around the city-- and provided us with an incredible view around Medellín. It's also free of charge! We only spent a few days here, so I wish I could say we saw more, but we didn't have a ton of time. My favorite thing we did was the Real City Tour because I learned so much about the history of the city. We were shown around by a local who had lived through all of the ups and downs that Medellín went through. He was very passionate about the revival of Medellín and wanted us to have the best experience we could have. -Ride the Metrocable all the way to the top-- incredible views! -Take a walking tour with Real City Tours. -Go to the rooftop of The Charlee. -Eat at a the hidden gem of a restaurant called Casa Comedor... you have to enter through a secret door next to a street side taco stand! 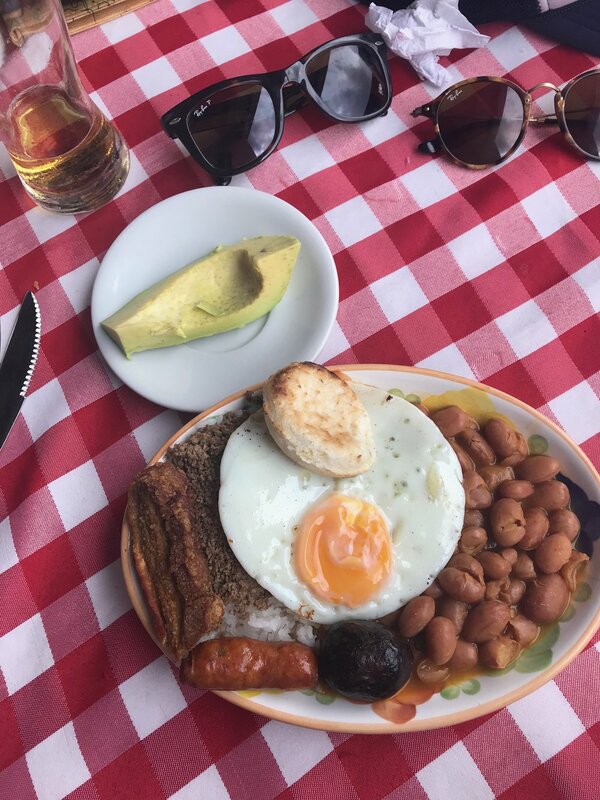 -Eat the traditional meal called "Bandeja Paisa". The restaurant Hacienda has a great plate of it! Overall, our trip was INCREDIBLE!! I honestly wish we would have had another week to explore even more and actually maybe relax a little bit! If you're wanting a quick trip that is really cheap and not too far-- Colombia would be perfect! It looks and feels like you're in Europe or somewhere very exotic, but it's only a short flight away. Please drop a comment or a question if you need help planning your trip! I'd love to help! Safe travels and happy summer!! I have been procrastinating on writing this, because I'm not exactly sure where to begin-- much like how I felt when first starting to plan this trip (ahem, two weeks before we left). Therefore, I'm going to keep it simple; give our basic itinerary, things to know, and of course LOTS OF PICTURES! :) That's all anyone wants anyways-- right?! Going about planning a trip like this is never easy, so hopefully this guide will give you a starting point if you want to go to this part of the world-- which I highly recommend. We narrowed down to 3 countries in 3 weeks (Thailand, Cambodia, and Vietnam). We spent the majority of our time in Thailand, but in retrospect we wish we would have toured Vietnam a little bit more. Three weeks was a good amount of time, but if you can do more-- always do more! It took a FULL 2 days to get there-- so prepare for that! We drove to Chicago (my family lives there) and stayed there before flying out at 1:00pm on a Wednesday. Flying out of ORD saved us about $1000!!! HOLLA! Round trip (for 19 hours in the air both ways) costed us $650 each. Not too shabby. We flew American Airlines to Tokyo, Japan (12 hours over Alaska) and then to Bangkok, Thailand (another 6 hours). It wasn't the worst thing ever-- I actually kind of enjoy long flights-- lots of time to journal (see my most recent post and HOW TO here) watch movies, drink some wine, and sleep. John hates them because he's so tall and he can't sleep, but I just curl up and I am OUT. We arrived in Bangkok on FRIDAY at 11:00pm because of the 12 hour time difference. We took a 2 hour flight on Thai Lion Air ($61 total for both of us) from Bangkok to Chiang Mai and stayed at the Wing Bed Hotel. Also very nice and around $35 per night. We were here for 2.5 days and 3 nights... this was an okay amount of time, but I could have stayed in this quant little town forever! 3 full days would have been ideal! We took a 2 hour flight from Chiang Mai to Phuket on Thai Smile (LITERALLY THE BEST BUDGET AIRLINE EVER-- John said he wanted to just stay on the plane forever LOL) for $104 total for both of us. We took a bus with lots of people to Karon beach (the worst 2 hour ride of our life-- skip the crowded bus and take a personal taxi-- definitely would have been worth it). We stayed at the Karon Sea Sands Resort and Spa and really liked it! Great pool and huge rooms! The Karon area had great beaches and was great for relaxing. The Patong area would have probably been better-- more things to do, but Karon was great! We stayed here for 4 days and 4 nights-- perfect amount of time, unless you want to beach bum-it a little longer. Lay on the beach with a fresh coconut or a Singha beer! Eat some banana pancakes and rolled ice cream! Wear a lot of sunscreen... I failed at this one. YIKES. We flew (go figure) from Phuket to Siem Reap on Air Asia (took about 2 hours and costed $67 total). We stayed at the Rithy Rine Angkor Residence (really nice, perfect location and a great pool!) for 4 days and 4 nights. This was a good amount of time, could have been shorter, but we enjoyed laying by the pool one whole day. We took a 2 hour flight from Siem Reap to Hanoi for $118 total and flew on Vietjet Airlines. Our hotel, the Charm Boutique Hotel & Spa, was right in the middle of everything and was very nice!! It was $40 per night-- can't beat that!! We stayed in Hanoi for 3 days and 3 nights, and that was the perfect amount of time! We loved this place SO much! The streets and traffic are INSANE-- it is exactly like the game Frogger trying to cross the street. Many locals told us the secret to getting across is to walk at a steady speed, don't stop or speed up because the motorbikes will go around you! It's so crazy, but you just kind of wade out into the traffic and it works! 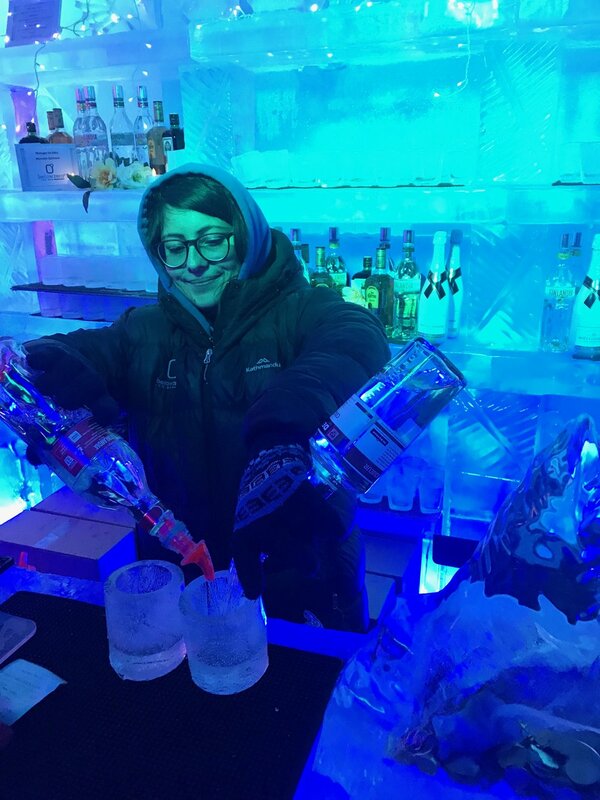 Lots of great rooftop bars! 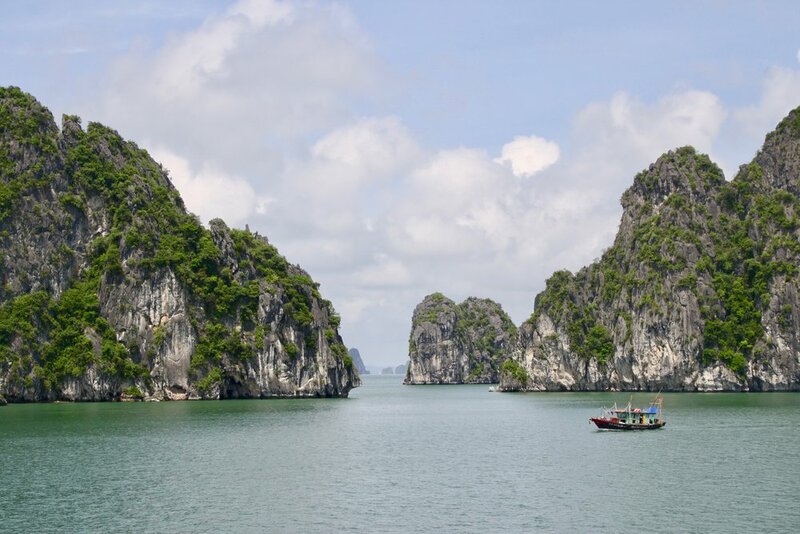 Getting to Halong Bay is the easiest from Hanoi because all of the Cruise companies arrange transportation for you from your hotel. It is a 3-4 hour bus ride (with a 30-45 minute stop in the middle of it) so it is not a bad ride. Our company came right to our hotel in Hanoi and scooped us up. Anyways, we cruised with Cristina Diamond Cruises. Since we paid $600 for 3 days and 2 nights (everyone else only paid $400) I expected a SUPER plush, fancy, over the top boat.... and that again was not the case. It was nice for Vietnam standards, but again we got ripped off by a website, not the cruise company. I thoroughly enjoyed this Cruise and the staff and highly recommend them! Victor was our tour guide and was HILARIOUS! So long story short, book Cristina Diamond, but go through Agoda.com or through the Cristina Diamond website! Don't give your money to Booking.com. The food on the cruise was AMAZING!! The dishes literally just kept coming out-- and it was all traditional Vietnamese food. The only downfall was that drinks were not included, so we had to pay for any alcohol and water. It was very reasonably priced though, so we did not mind. 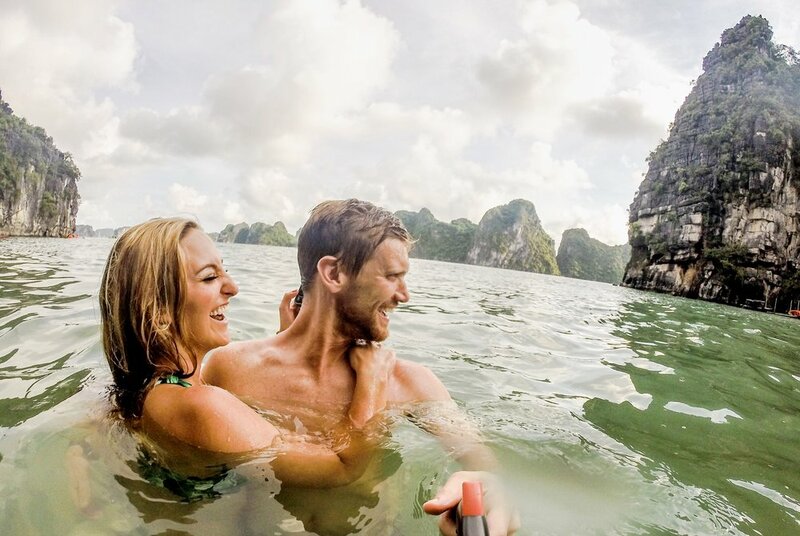 Thailand: No Visa needed, unless over 90 days. 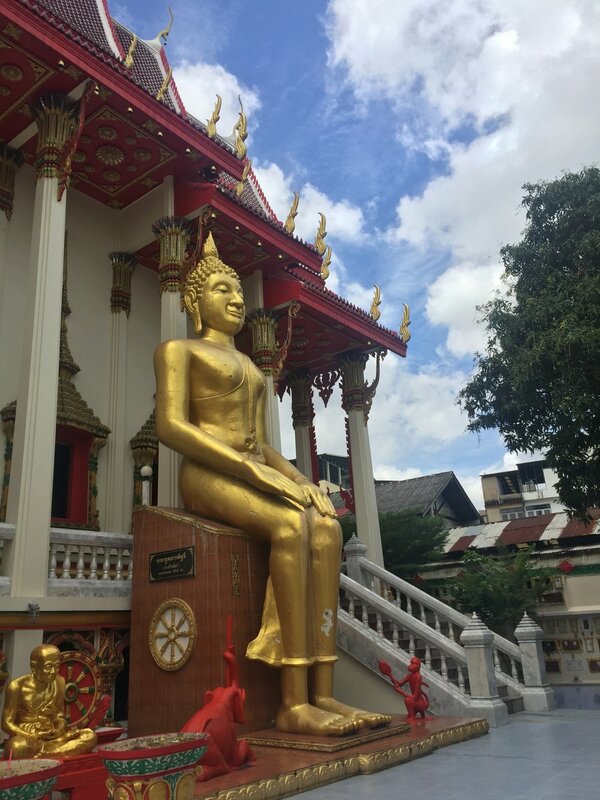 Cambodia: Apply online or get a Visa on arrival. Vietnam: Apply online (must be done ahead of time) and get a Visa on arrival. We went to Passport Health before leaving and got a Hep A vaccination. They recommended Typhoid, but we didn't get one of those and took our chances. 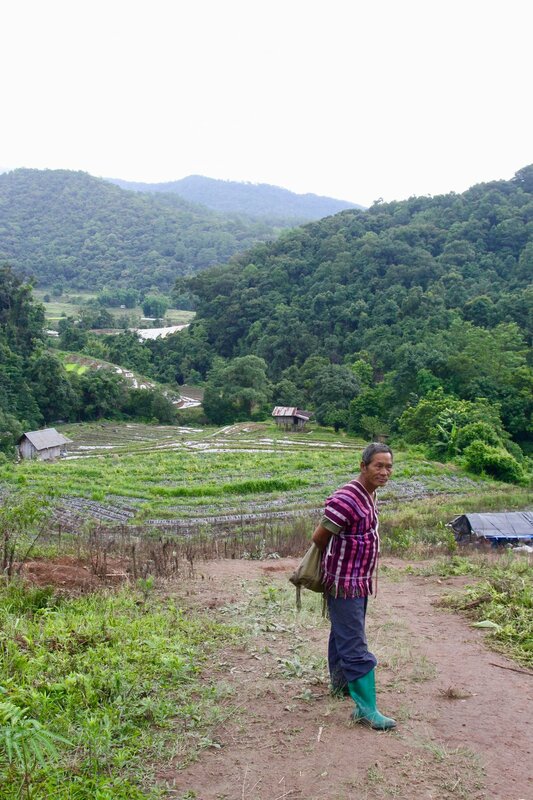 There are a lot of health concerns in this part of the world, so I am glad we learned about all the bad things that could happen to prepare for them (there's a pretty long list-- yikes!!). Mosquitos are definitely an issue (Zika, Dengue Fever, Malaria, and Japanese Encephalitis- just to name a few), so we used this travel sized bug repellant from amazon here. We also sprayed our clothes before going with this stuff here. We also took plenty of these Travelan pills, here. They prevent you from getting sick if you eat something questionable. We didn't have any trouble our entire trip! In the summer when we went (June and July) it was SO incredibly hot. Its almost always hot in SouthEast Asia, but it is definitely worse in June and July because it is the rainy season. The humidity is out of this world, and we were instantly drenched after being outside for 5 minutes-- cute, right??? I mainly packed long maxi skirts and dresses, and light weight clothing (tanks, cotton t-shirts, breezy dresses, etc). I brought light weight jogger pants from Old Navy, or you could wait and buy them there. There are tons of cheap places to buy "elephant pants," but I was happy I had a dressier pair. I didn't bring any jeans and only one light weight cardigan. To get in to the temples you have to have your clothing covering your knees, no low cut tops, and your shoulders must be covered--- and they are not joking about this! John had regular khaki shorts on and they wouldn't let us in. He had to go buy elephant pants at a small shop (see below, LOL!!!). My outfit of choice was almost always a maxi skirt and t-shirt for these occasions! For shoes I went with trusty rainbows, old navy sandals, and chacos! With the humidity the way it is-- I didn't worry about my hair at all and didn't bring a blow dryer, curling iron or any kind of heat hair tool. I just let it air dry and mostly had to wear it up because it is so long and sticks to me (gross.). For plugs and adapters-- they aren't needed! We brought a converter which helped, because our GoPro battery got fried in their outlets... but other than that you can plug things directly into the wall! Our favorite country was Vietnam because we loved feeling like a local sitting and eating on the street. 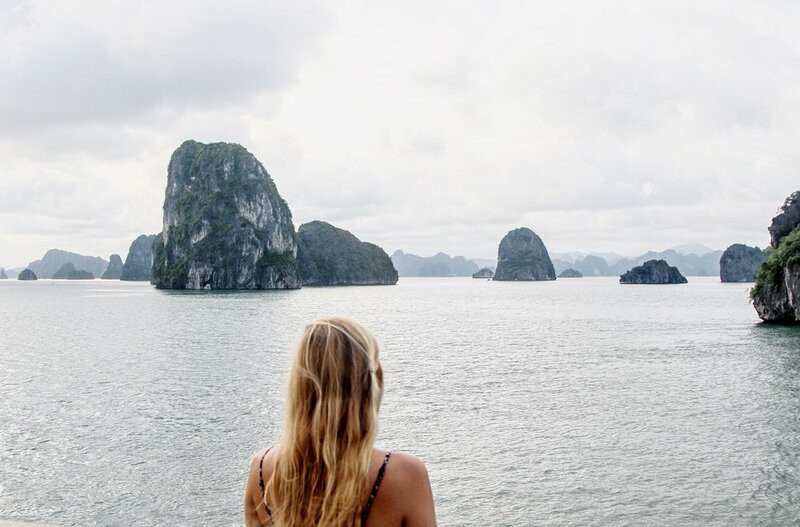 We also had the best time on our cruise through Halong Bay. The sights were incredible, the food was amazing and the people we met were so fun-- which made this a huge highlight. Chiang Mai was another top city and playing with the elephants was another highlight. There was really so much we loved and we had such a great experience. I hope this guide helps! Please don't hesitate to contact me if you have any other questions! Happy traveling!! Happy Wednesday! Long time no post (I feel like I start every blog with that lol)... but, L I F E.
Anyways, I recieved a lot of questions and comments on my travel journal from our past adventure, so I wanted to share my process with you all and how I go about making one of these CRAZY things! 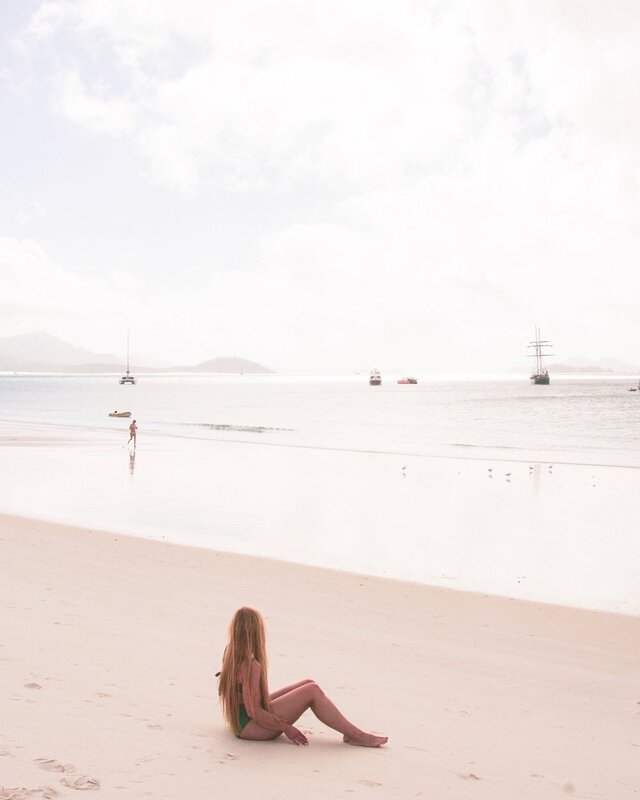 If you are planning an upcoming trip abroad, or about to hit the beach for a week, or even if you just want to document life, I will tell you everything you need to know! I used to keep a collaged journal for each year of high school, college, and then my first couple years teaching... but I've since stopped because it just got too hectic. Now I keep them on mine and John's excursions that we take every summer. So here goes nothing! When I go about searching for "the one" I keep a couple things in mind. I want it to fit in my purse/backpack easily, but I don't want it to be too small that I can't fit all of my post cards, maps, etc. I have had great luck with journals at TJ Maxx, Wal Mart, Marshall's, etc. I am honestly always on the lookout for a good one throughout the year, and I may or may not have a stash in a box, just waiting to be used. Finding the perfect one is the fun part for me! In my opinion, the perfect size is 7 inches by 9.5 inches or 6 inches x 8.5 inches. 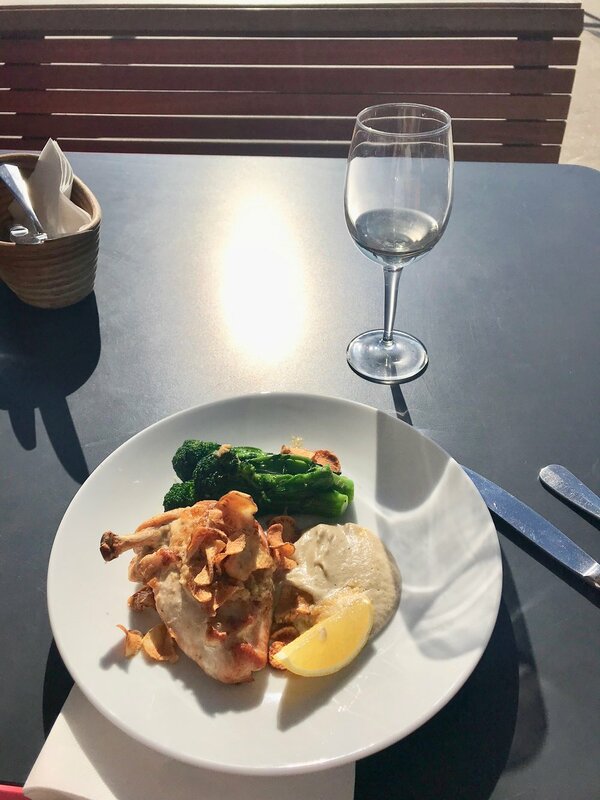 If you are only going somewhere for a week, you can get a smaller one, but for each of our trips ranging from 2.5 weeks to a month those sizes have been perfect! I always try to find one that has at least 175-200 pages. The black journal is the one I took for our past 3 week Southeast Asia trip linked here and it was the perfect size and amount of pages. I actually used every page exactly without one to spare. And BONUS-- it's only $7! When I studied in Florence for a semester I got the same brand of journal from Wal Mart (Shown above-- the pink one) and wrote all 100 days I was there. I didn't have as much collage material because I couldn't afford to eat out/do activities every day, but it ended up being the perfect size for the 3.5 months! It's dimensions were 7inches by 9.5 inches. IT IS A MONSTER. I prefer leather journals like the ones above, but for our month long trip to Europe I used the first tan and pink one with the spiral and it worked great. Just make sure it is substantial and won't fall apart if you are lugging it around everywhere! For the month long trip I actually ran out of room and had to start writing on top of receipts and other memorabilia like shown below-- definitely should have gotten a bigger one for that trip! This is the fun part! As you are traveling or just living life, save everything! John and I both go into MAJOR HOARDER STATUS while traveling and literally take and save everything. Any brochures I find in restaurants, pamphlets, tickets, receipts, boarding passes, beer labels, wine labels, business cards, post cards, sugar packets (weird I know-- obviously empty them), but basically anything that is flat that we use/run across. The more you save the more interesting your journal will be! If you are in a different country it is so awesome to keep anything with the language on it or anything that will spark memories from being there. Seriously, save it all. People will look at you...they WILL stare... especially when you are aggressively trying to get that wine label off the bottle-- but don't let that deter you! LOL it happens to us A LOT. This part comes easily to me (duh-- I collage with kids for a living), but I will try to break it down as much as possible! The first few pages are always a little rough because we haven't gotten there yet and don't have much to collage. I always start with boarding passes and stupid stuff from the plane/any receipts from the airport (you know I gotta hit up the Burger King before we leave lol). I start by laying out everything I have (this gets tricky on the plane, but is still doable) and arrange it on the page to make it look aesthetically pleasing. I almost always go in order (or try) of what we did, so that for the most part the things on the page correspond with what I am writing about-- doesn't always happen, but I have gotten pretty good at getting close enough. I usually try to keep it interesting (not all white receipts on the same page) but still keep the colors all in the same family as much as possible-- it just looks better this way and as a perfectionist it bugs me if they don't somewhat match. When you like how it looks, start gluing! I use the Elmer's Xtreme because they last a long time and keep everything glued well. For SE Asia (3 weeks) I took 2 big ones and had just a little bit left. Brochures are great to snag if you do an activity or go to a museum. We always get 2 of them so that we don't have to choose between pictures on the front or back and can cut out everything that we want to put in the journal. This is where the scissors come in handy. I'm not proud of it, but I usually try to sneak the kid scissors on the plane and sometimes (actually a lot of the time) I get away with it! They are dull, so not dangerous or anything-- but then the other half of the time they get thrown away. When you are flying between every country and city like we were in Asia, this gets really annoying to keep having to find scissors and buy them. We finally just started asking our hotel staff if we could borrow a pair, which worked out much better. Here are some pictures of brochures that I have cut and collaged, but still kept the pages interesting by adding receipts, beer labels and other items. This part is NOT EASY. There were many days I was so exhausted from going all day, the last thing I wanted to do was sit down and collage everything, try and remember the details, and then actually write in story-form. There were days I wouldn't work on it at all and therefore would get really behind. Luckily, John has an elephant brain, so I always have him jot down in my phone each day and date and little bullets of what we did, funny things that happened, where we ate, what we ate, etc. Having this outline helps SO MUCH when having to go back and remember in sequence what you did. I highly recommend doing this at the end of each day, so that you don't forget important details. It's definitely a struggle, but it's nice to have something to do in the evenings when we get back to the room. I always tried to at least get everything collaged in the journal before traveling to the next place, that way all of the stuff isn't falling out everywhere and I can at least start writing on the plane/train/bus/etc. I hope this helps and inspires you all to keep your own! They are definitely not easy, but so rewarding to have down the road! I am constantly going back and looking at ours. I put a lot of detail into them, and its amazing the things you forget if you don't write them down! Drop me a comment if you have any questions or enjoyed this post!! 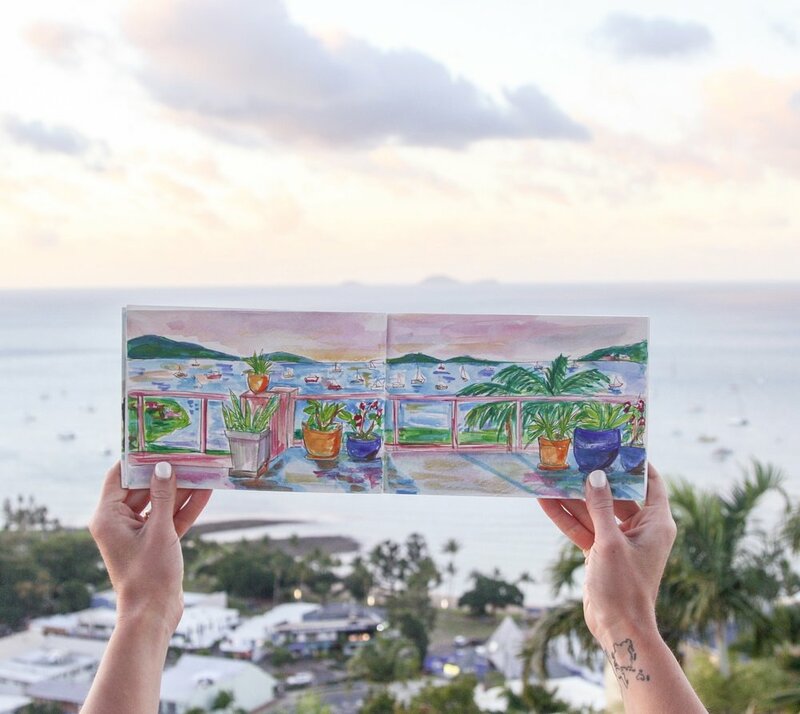 I would LOVE to see your version of travel journaling or if you make one because of this! Thanks for reading! Happy journaling!